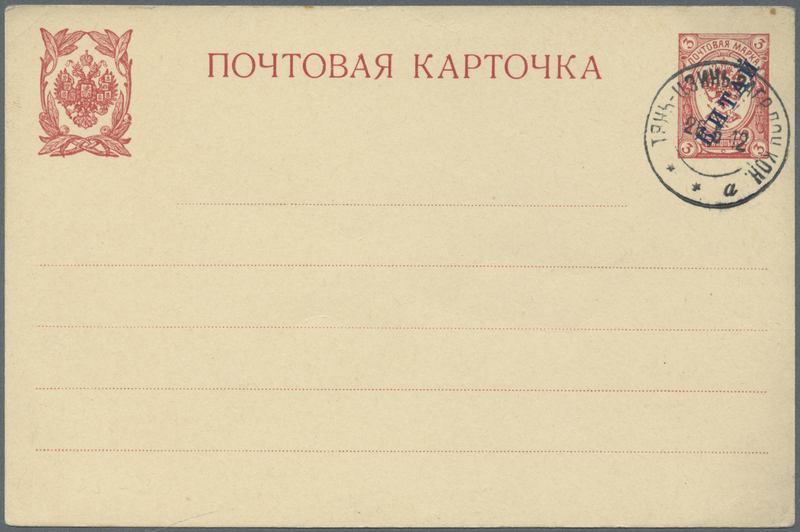 19884 Brief (cover) 1 u.a. 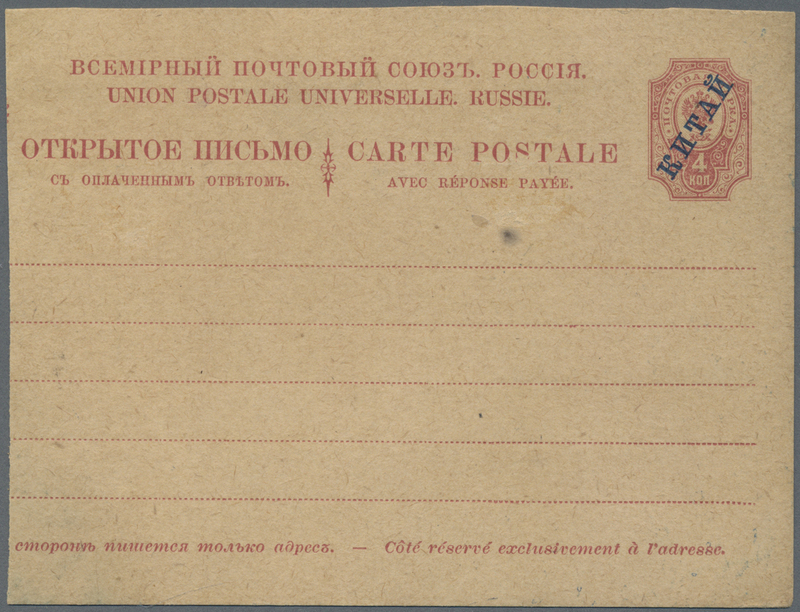 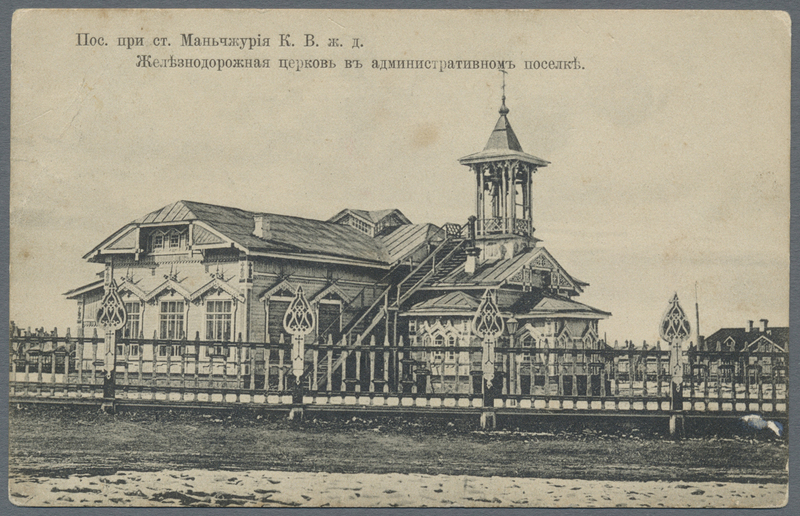 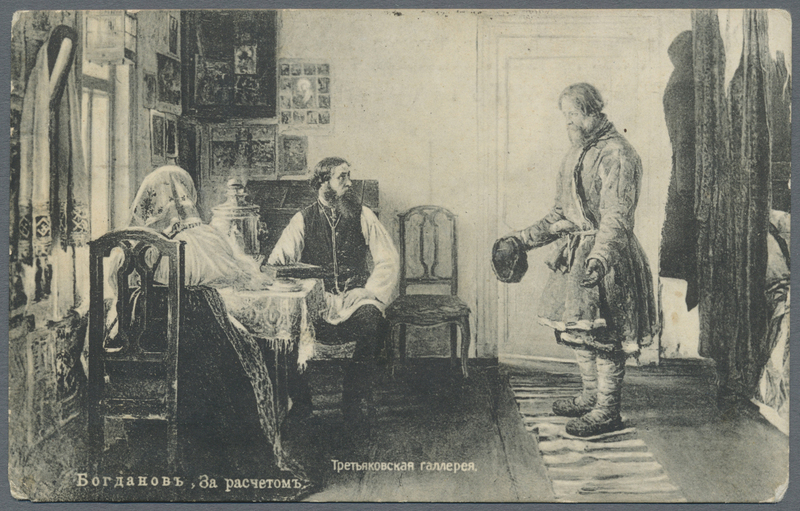 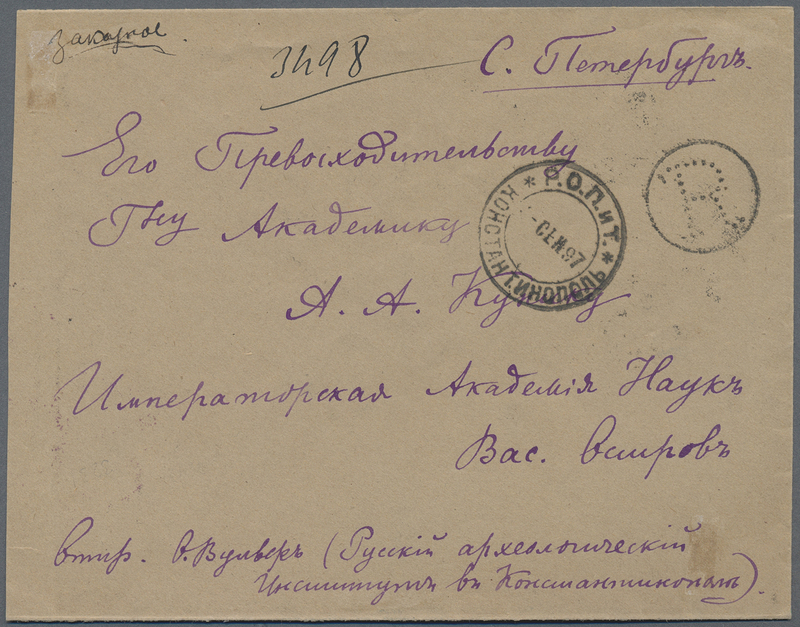 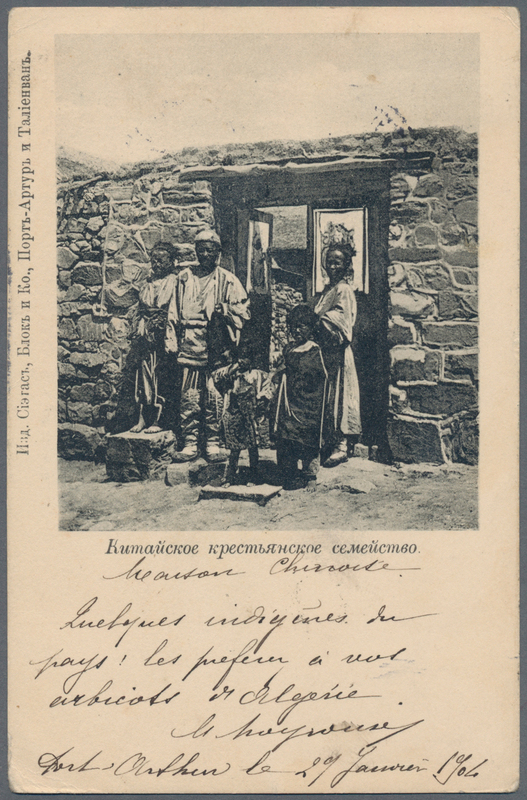 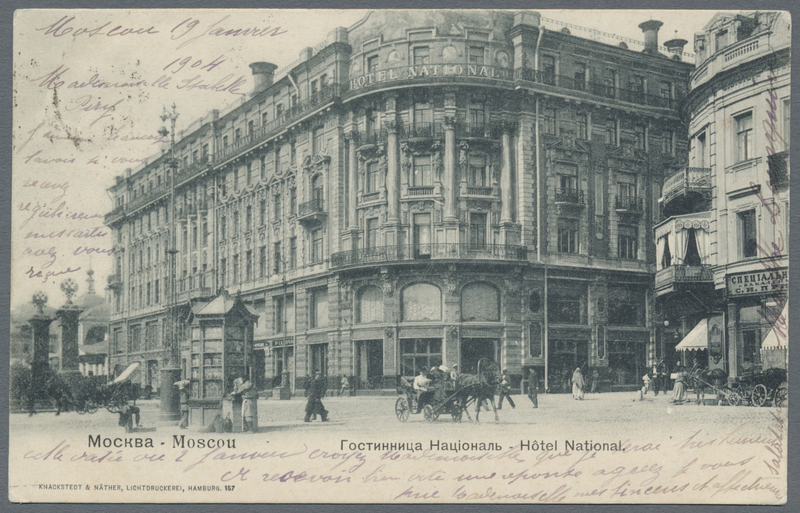 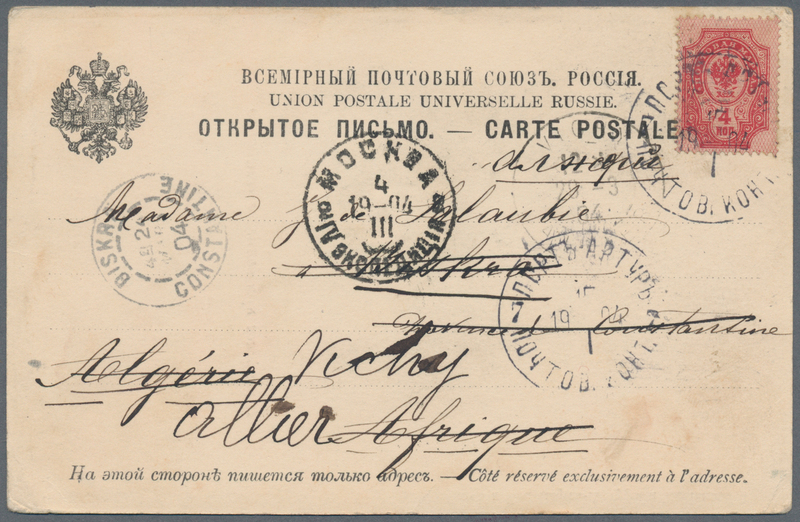 Russian Offices 1903. 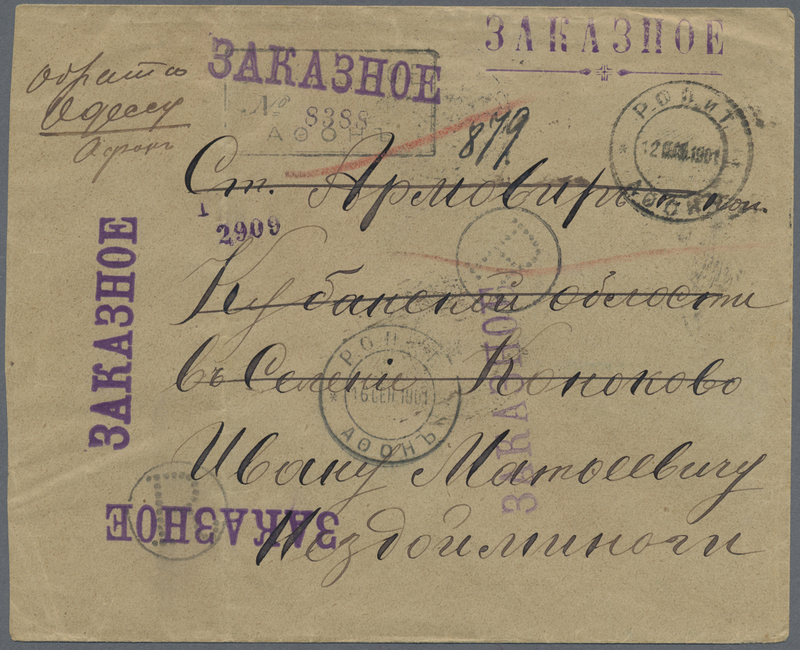 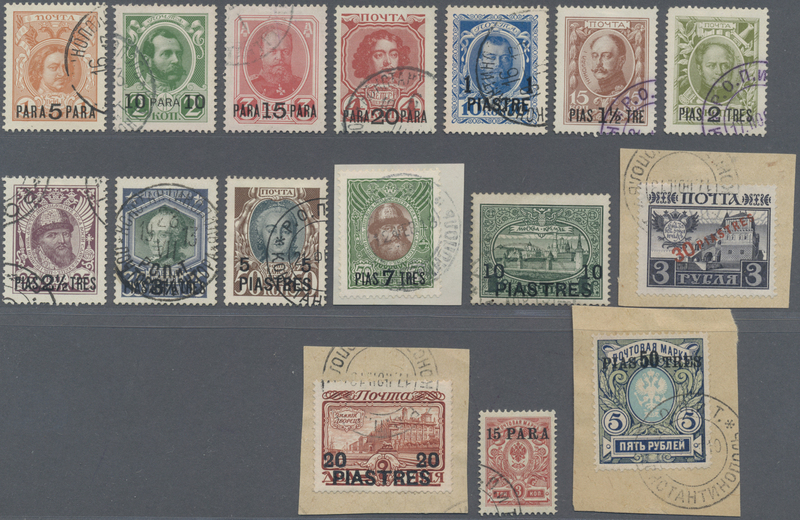 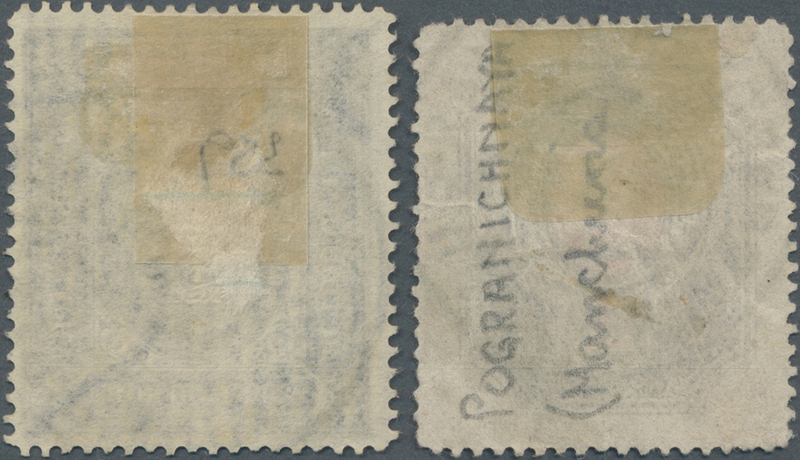 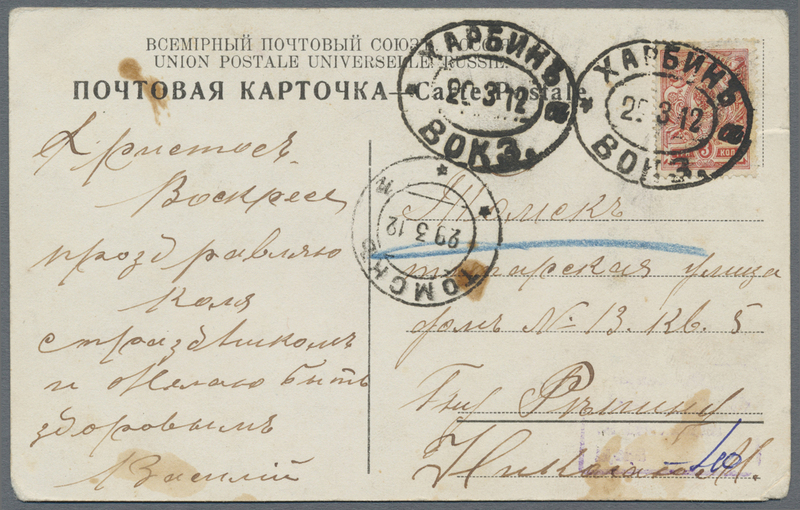 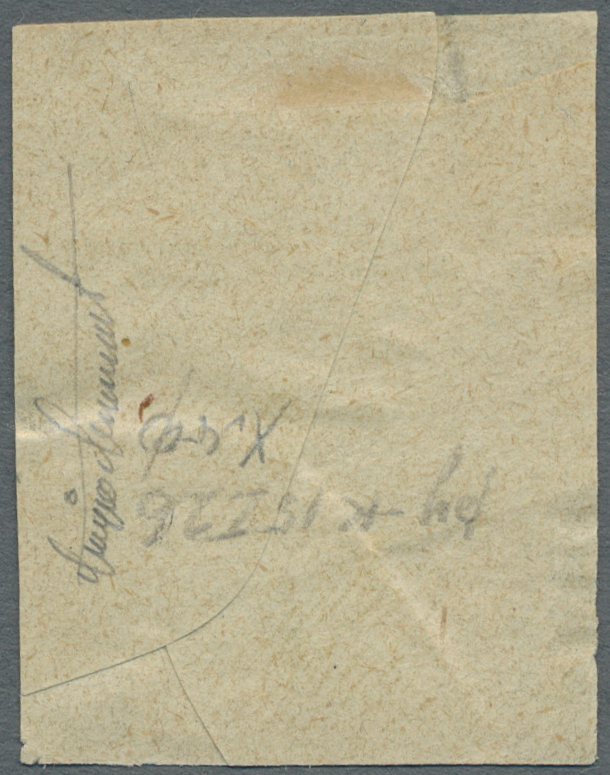 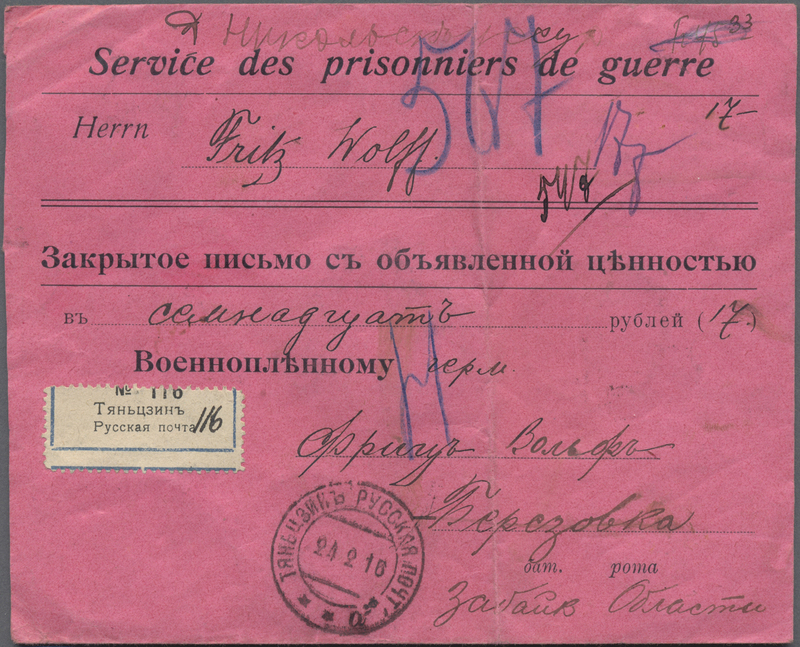 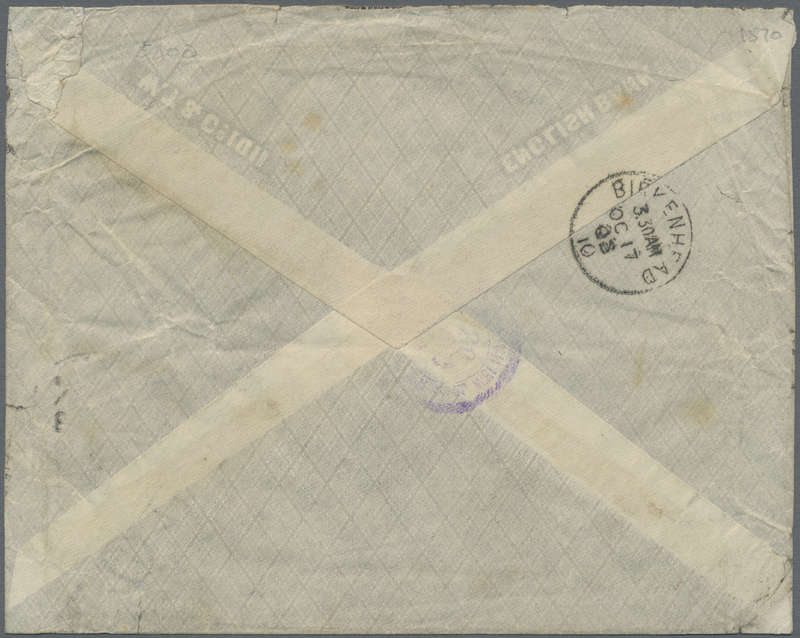 Registered envelope (flap missing) addressed to France bearing Russian China SG 1, 1k orange (3), SG 2, 2k green, SG 3, 3k carmine, SG 4, 5k purple, SG 5, 7k deep blue and SG 6, 10k blue tied by Pekin/Pochtov.Kontorta/1 date stamp with circular 'R' hand-stamp and Pekin registered label with Quimper receiver on reverse. 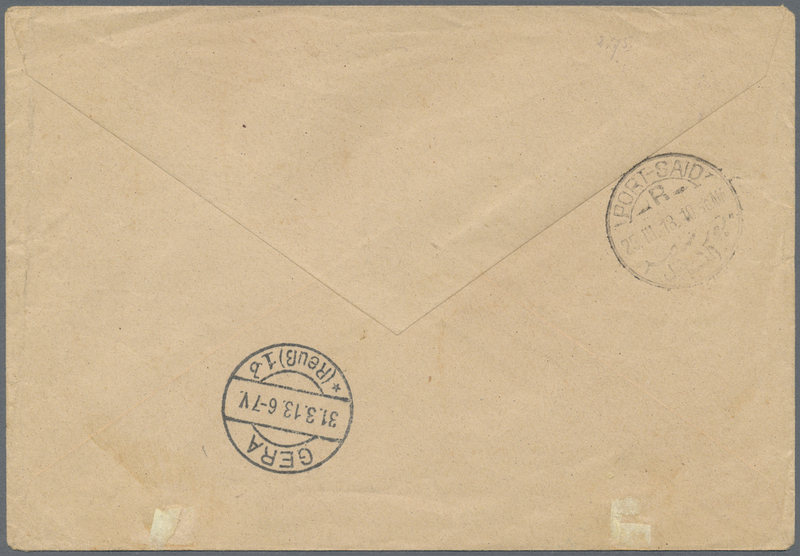 Very attractive franking paying the double registered rate. 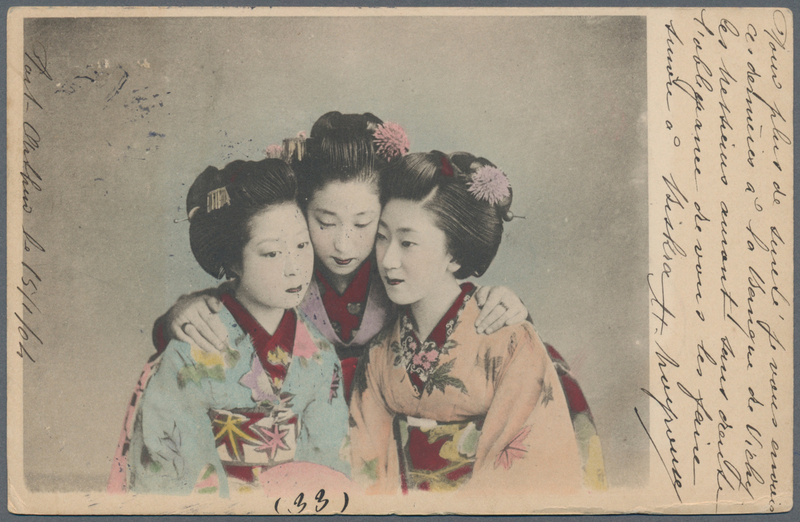 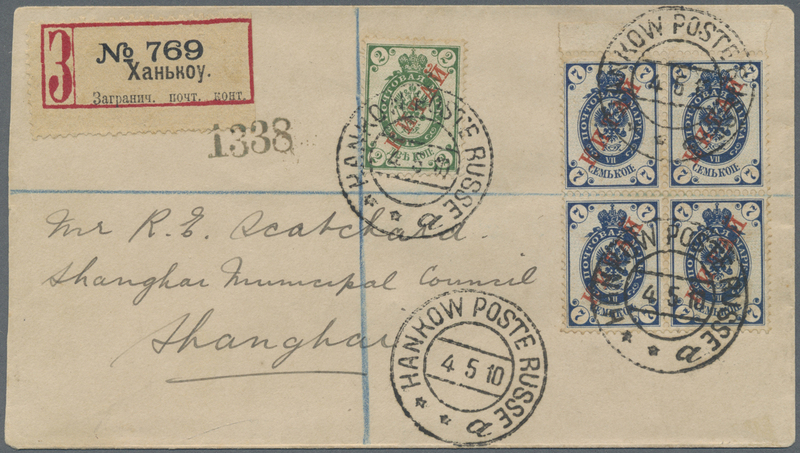 19885 Brief (cover) 1, 5, 6 (2) 1903, 1 K., 5 K., 7 K. (pair) tied "INKOU 25 IX 03" to cover (faults) endorsed "Via Chefoo, Port Arthur Moscow" to Birkenhead/England, on reverse faint strike of violet bilingual "LIU KUNG TAO/WEI HAI WEI" and Birkenhead Oc 17 arrival. 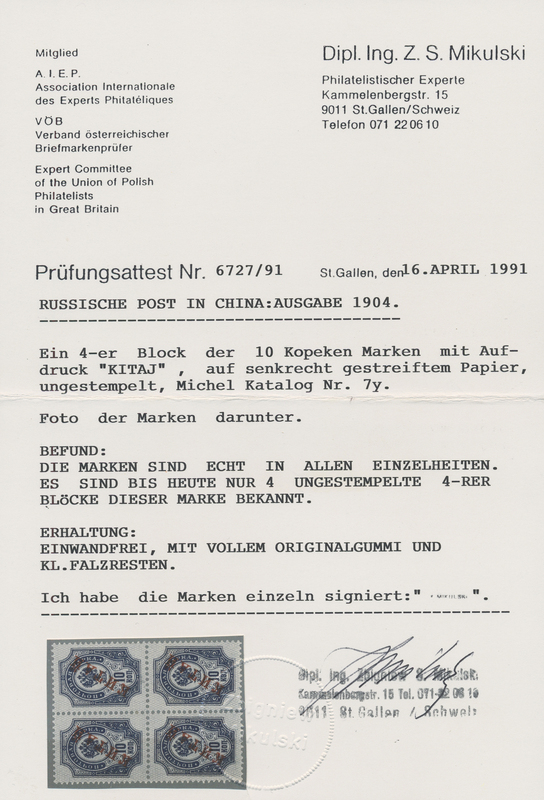 19886 Ganzsache (Complete) 1 + p/s 1907 Postal stationery card 3k. 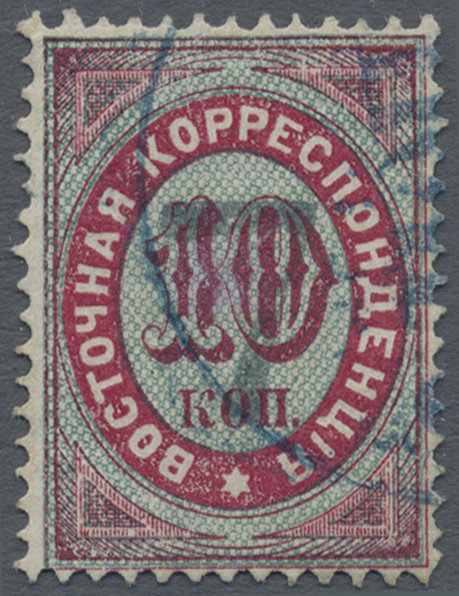 uprated 1k. 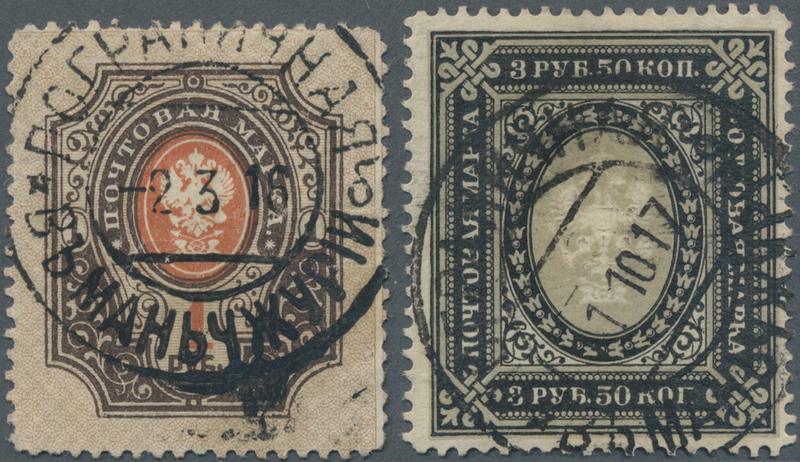 orange both optd. 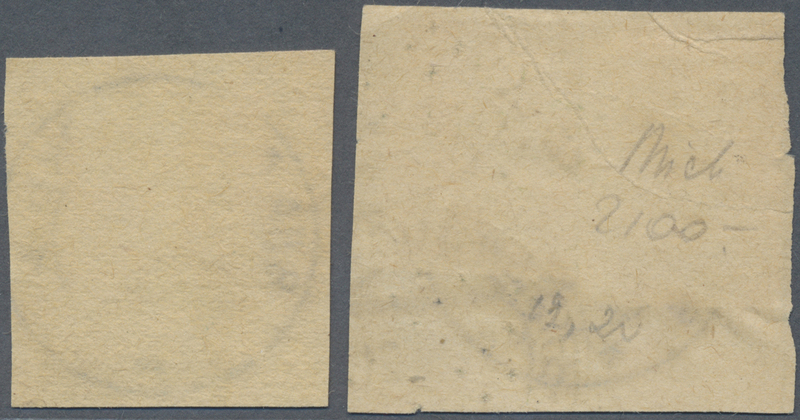 "?????" 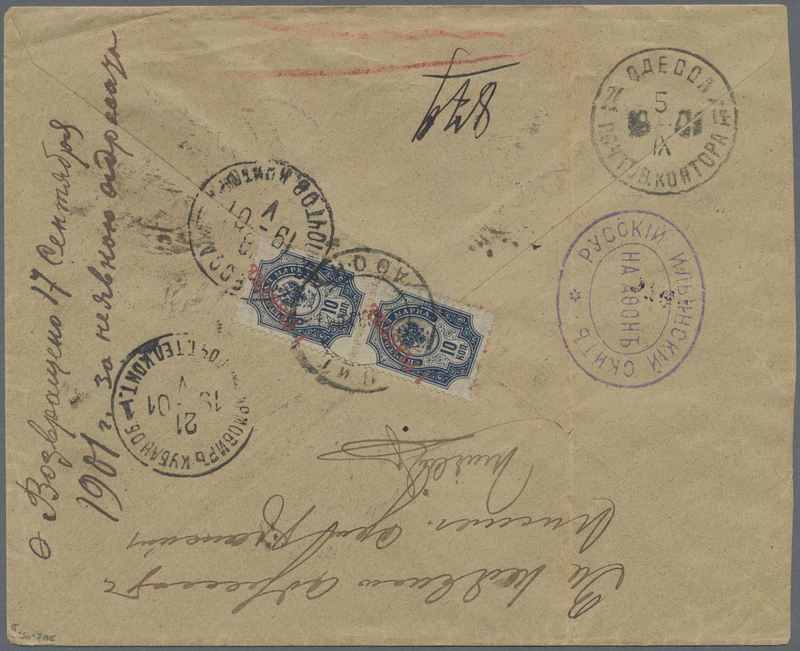 in blue and used from Shanghai to Dresden, Germany, tied by Shanghai, Foreign Post Office "?????? 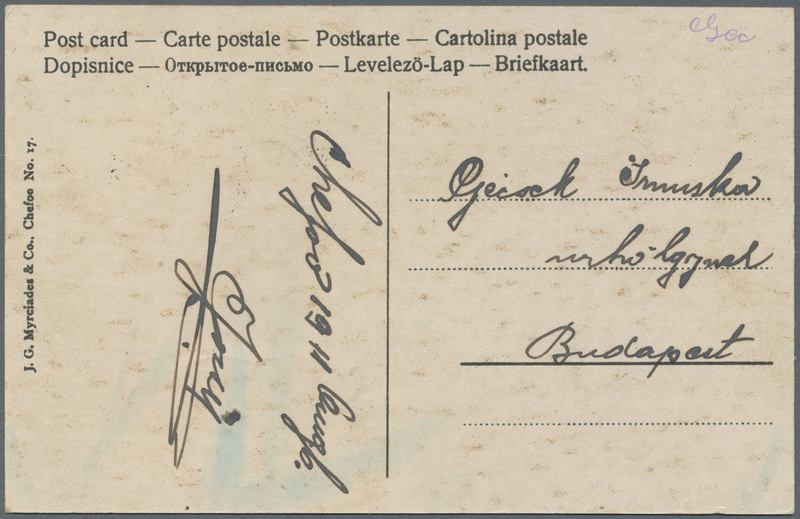 ??????.?. 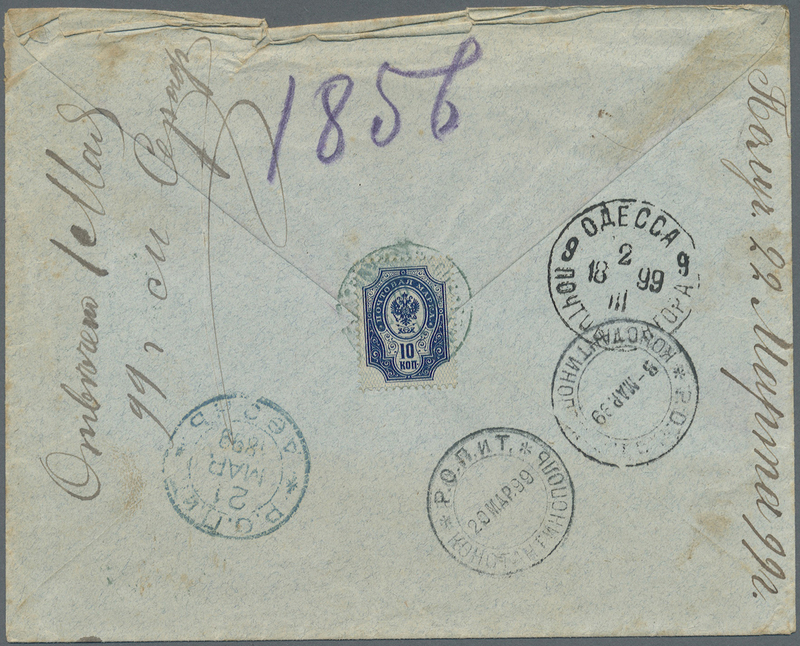 ?./11 5 07" c.d.s., and with Dresden '13.6.07' arrival cds alongside. 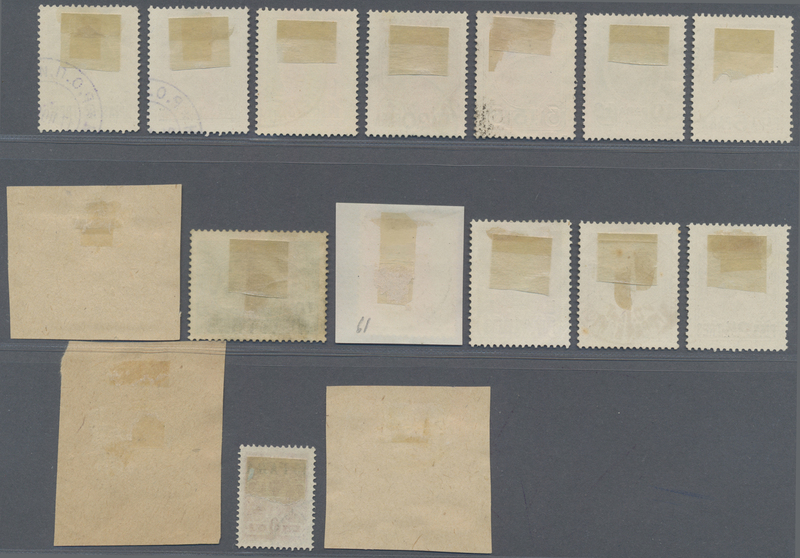 The 1c. 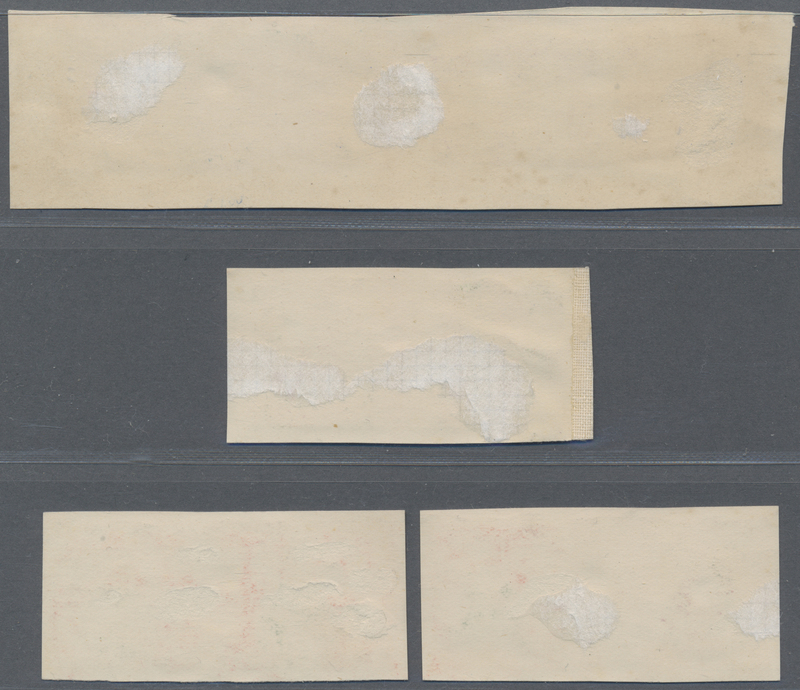 adhesive with a corner fault at lower left otherwise fine. 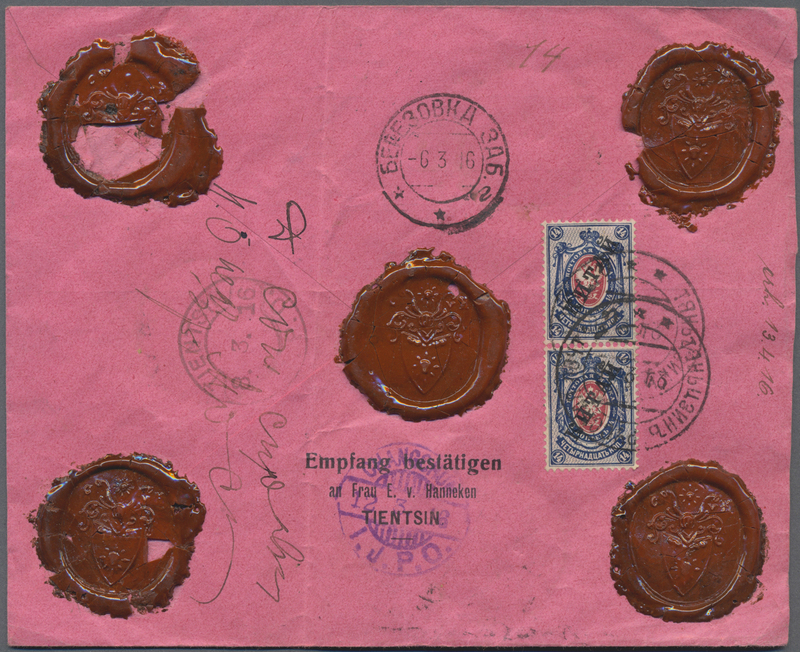 19888 Ansichtskarte (Picture postcard) 2+3 1898, 2 K., 3 K. tied violet "Chefoo 25 X 00" to ppc ("Wei-Hei-Wai, ed. 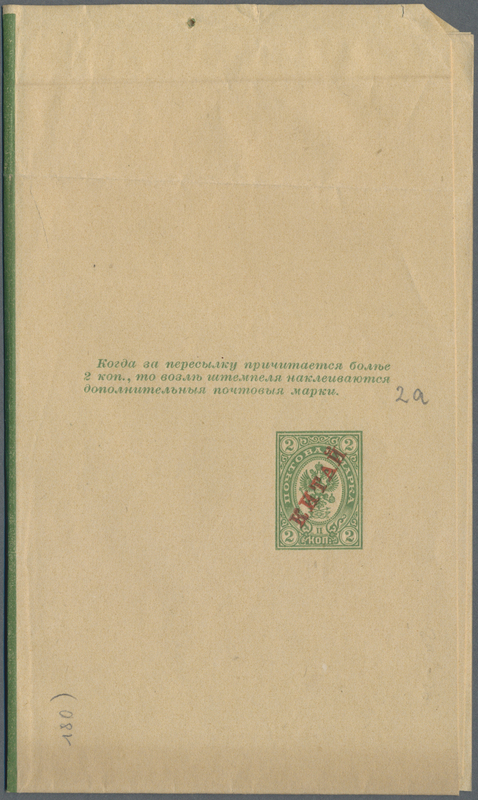 Sietas&Co.) 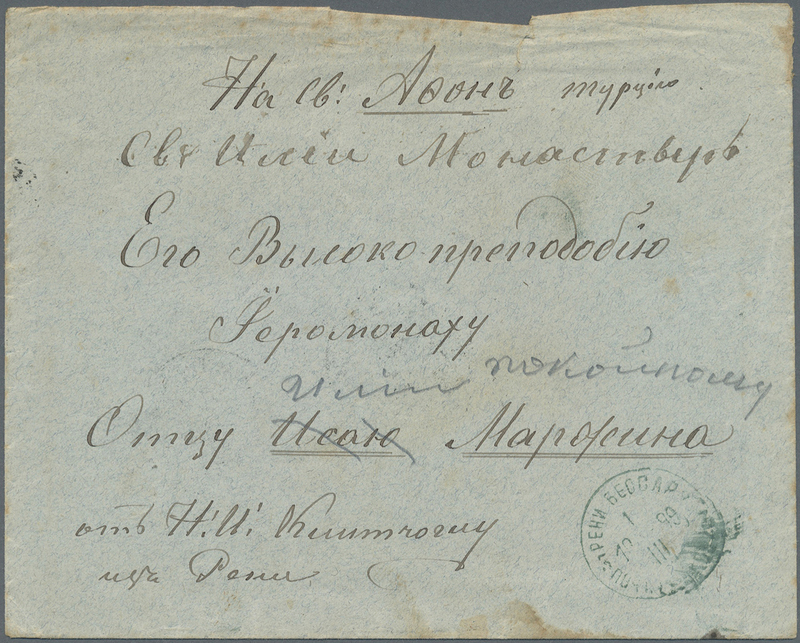 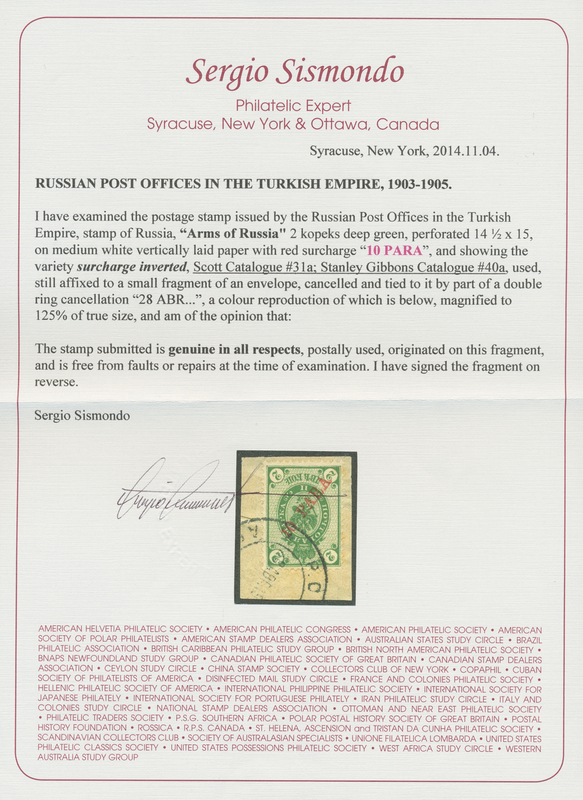 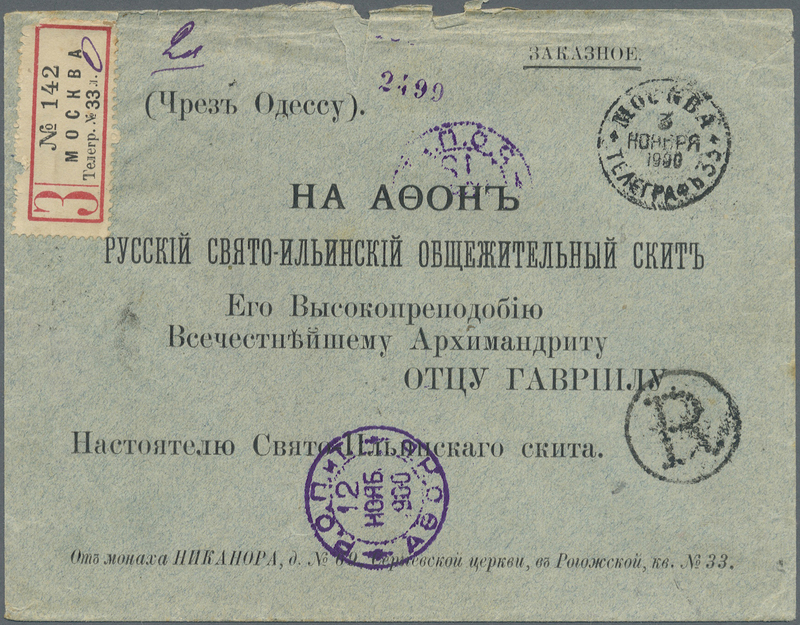 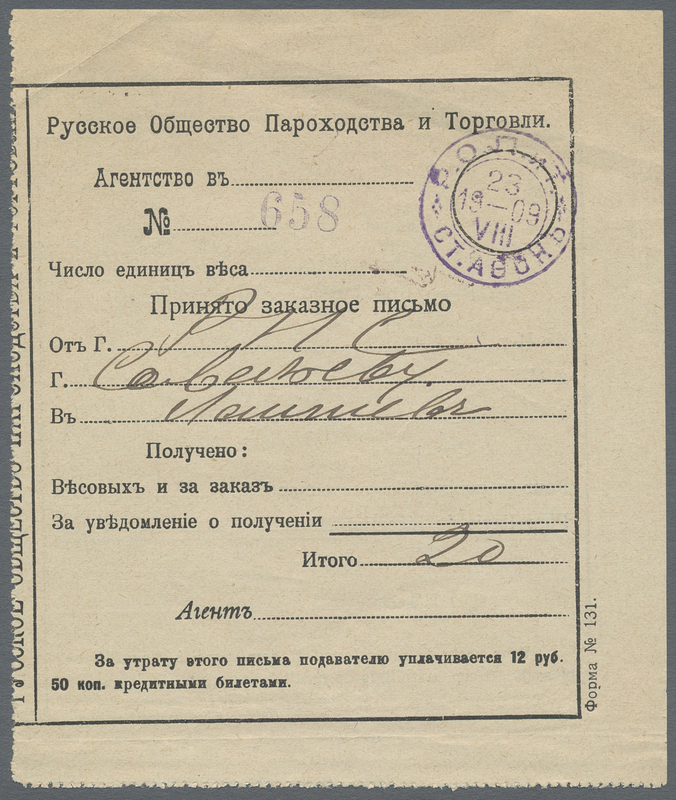 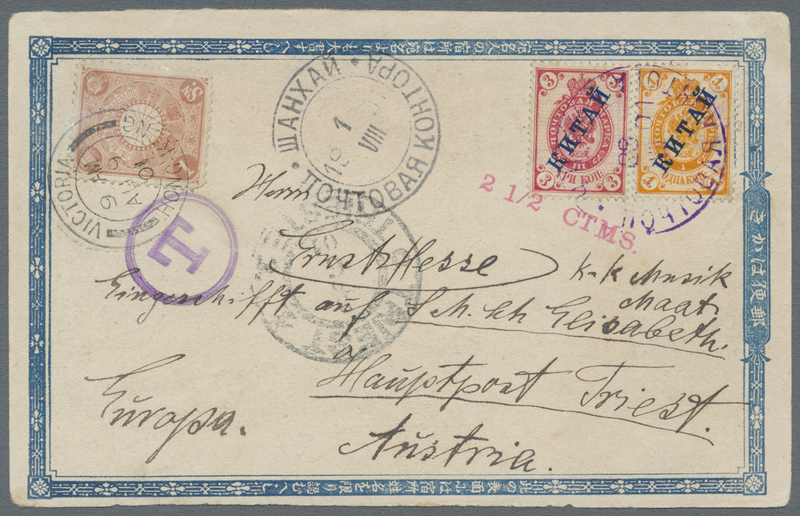 to Imperial&Royal Navy Academy, Fiume/Hungaria (present Rijeka)., transits russian p.o. 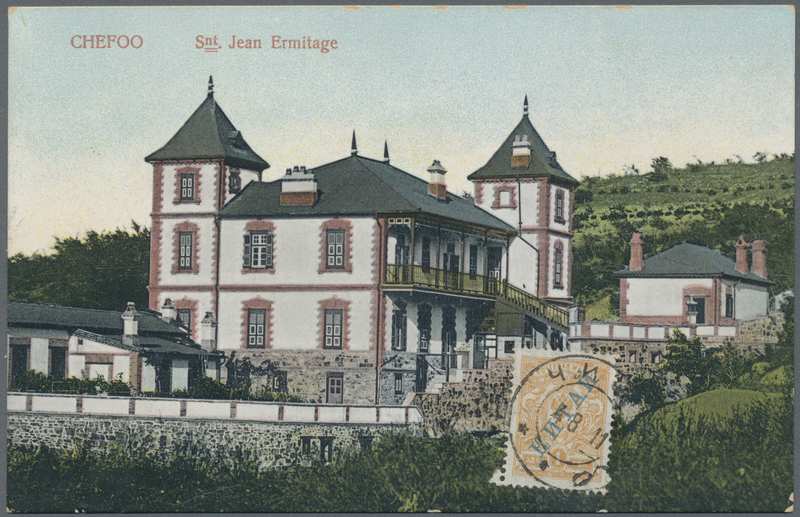 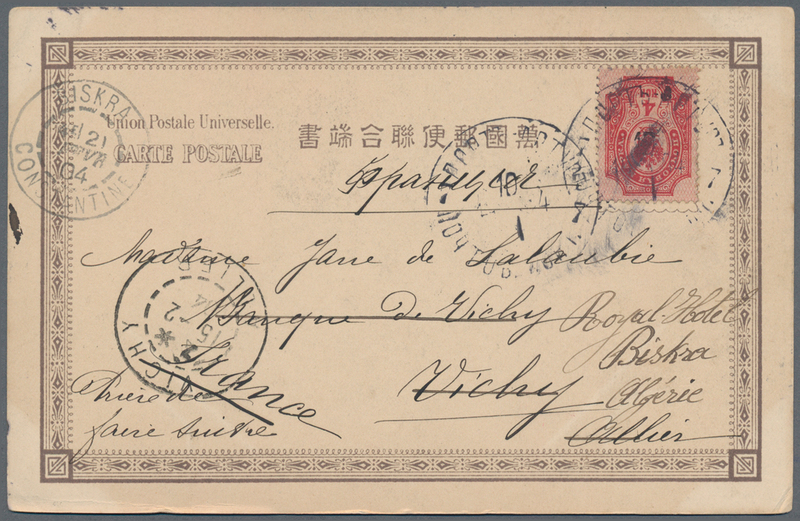 "Shanghai 16 OKT 1900", french mail steamer "(Yokohama) a Marseille", Triest and arrival Fiume Dec. 6, card corner creases. 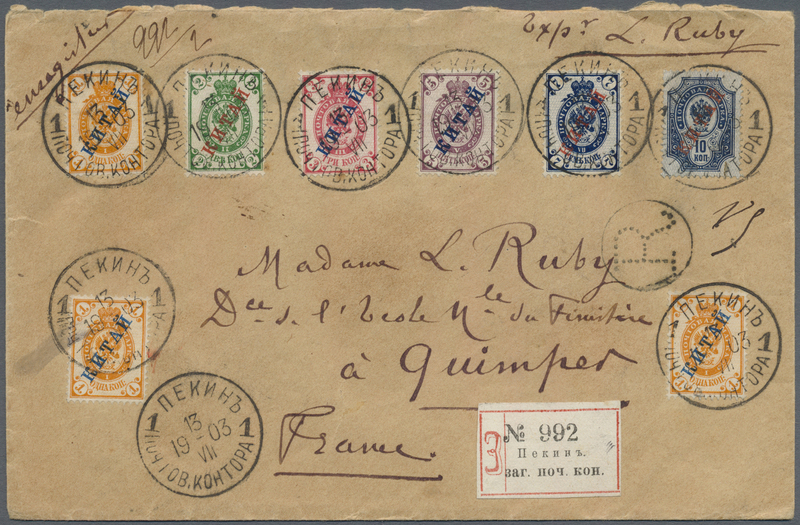 19892 Brief (cover) 6 1899, 10 K. horizontal pair tied "PEKIN 21 VII 03" to registered cover endorsed "250 francs" (insured?) 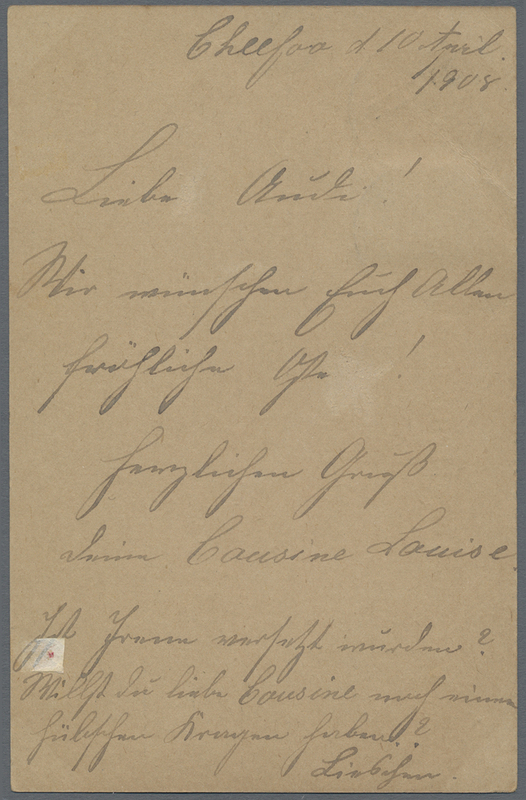 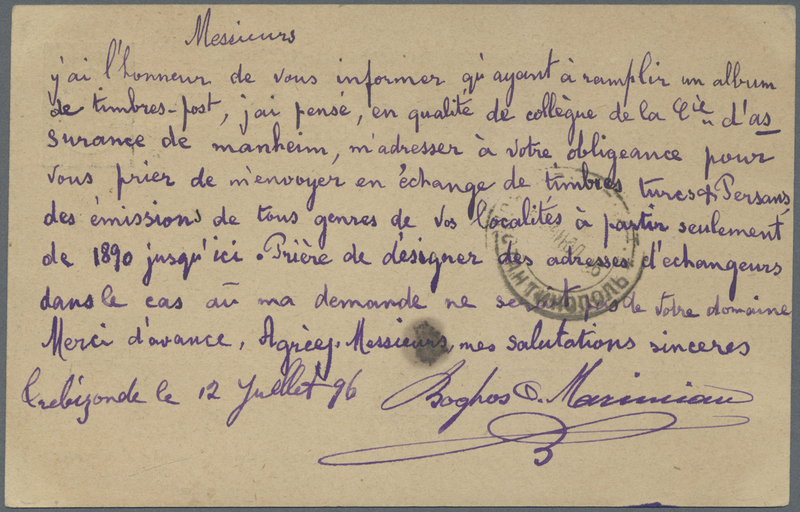 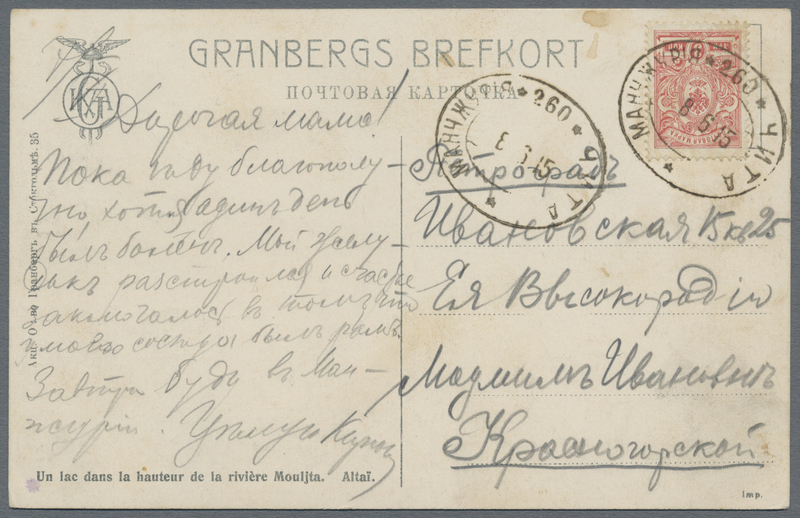 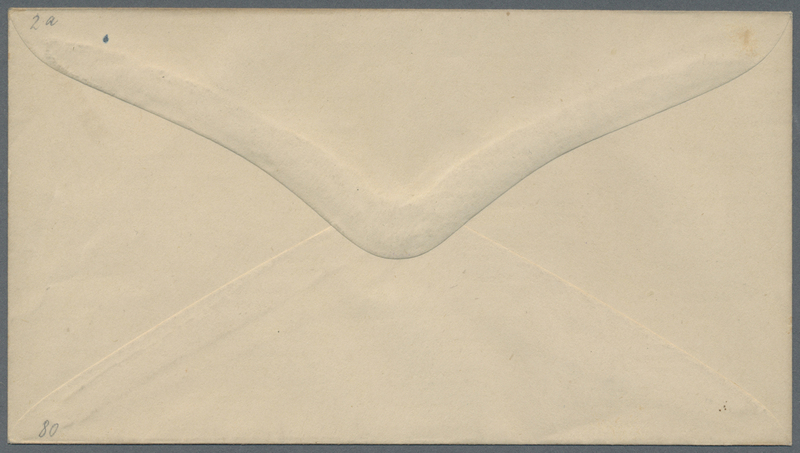 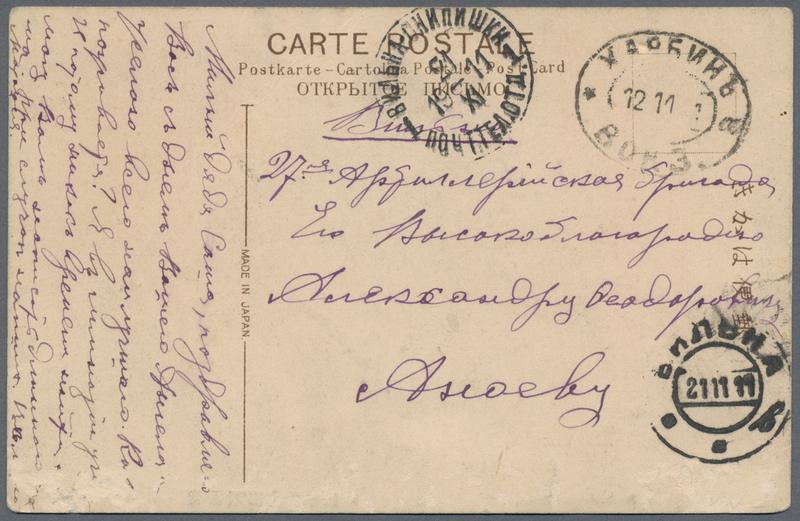 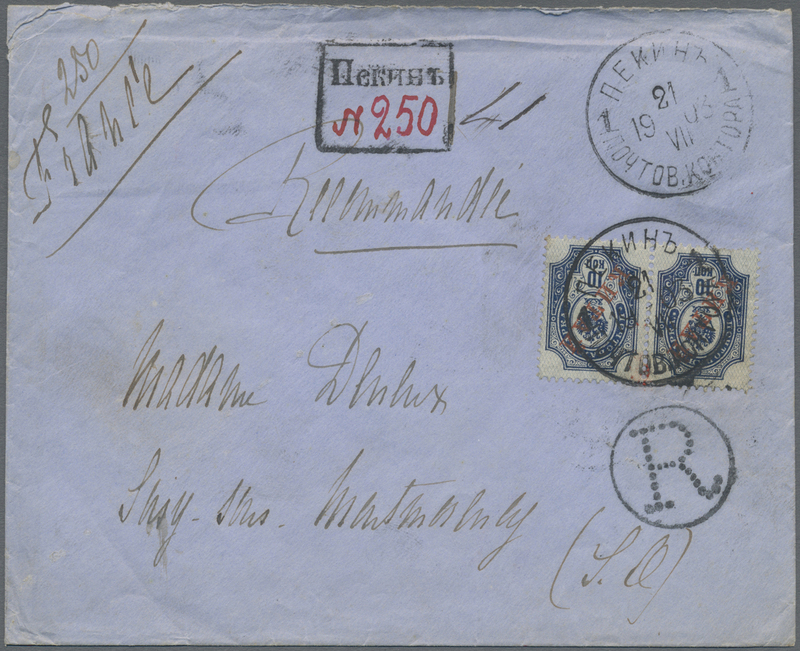 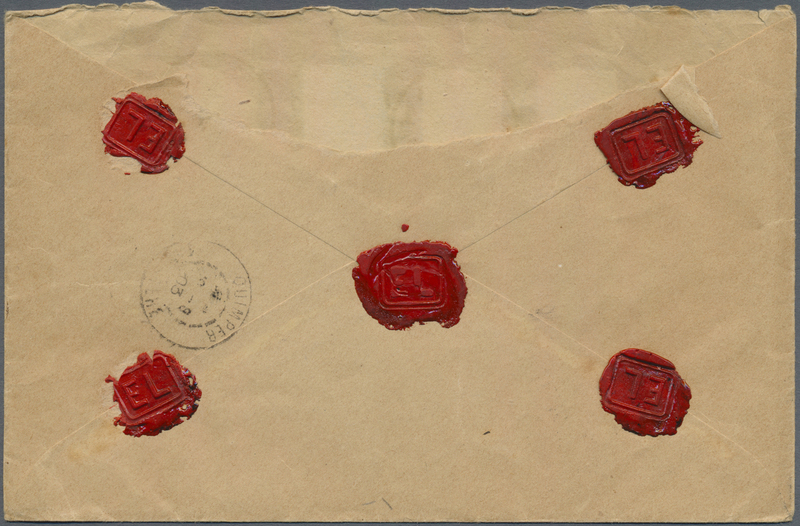 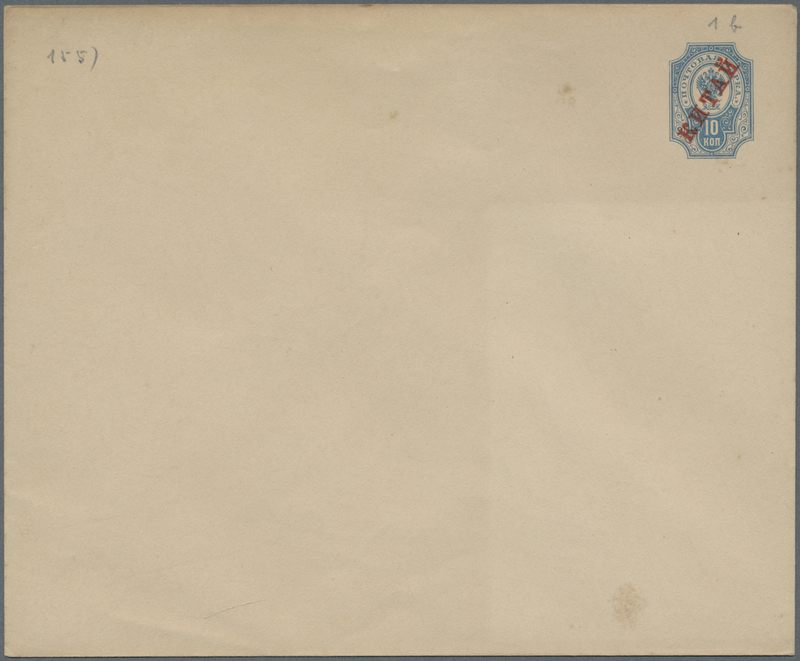 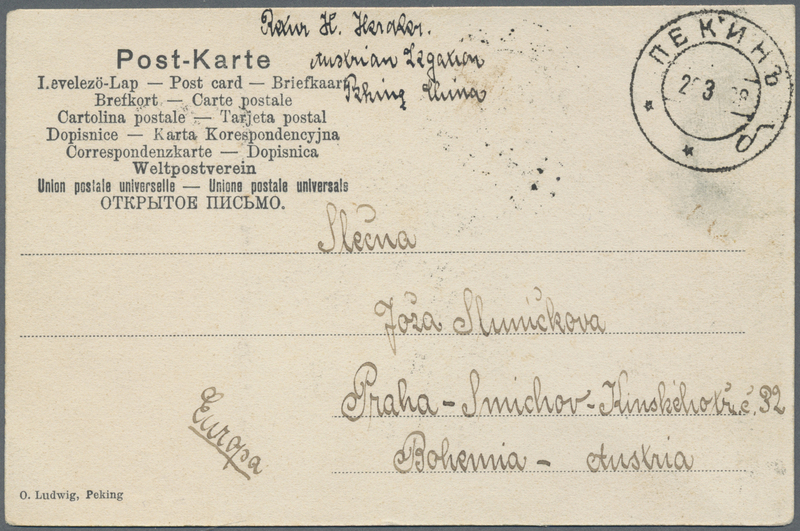 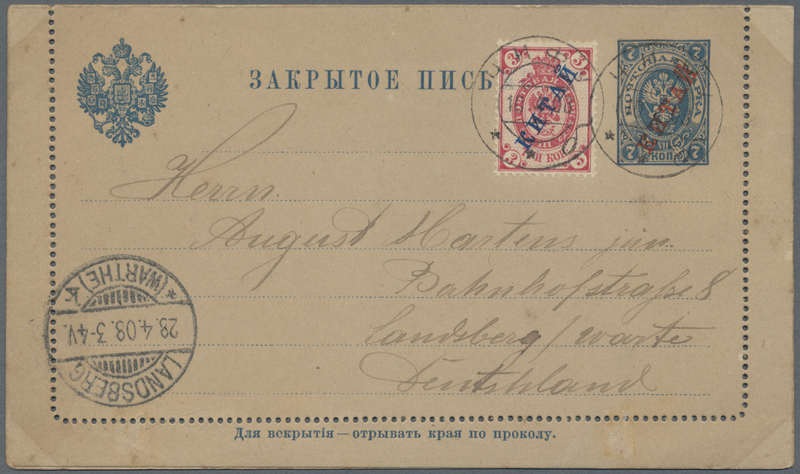 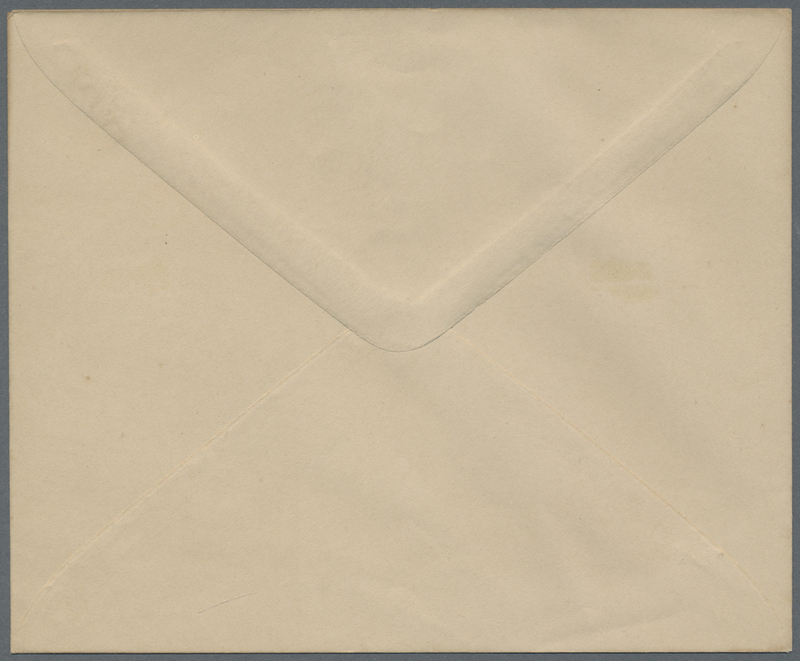 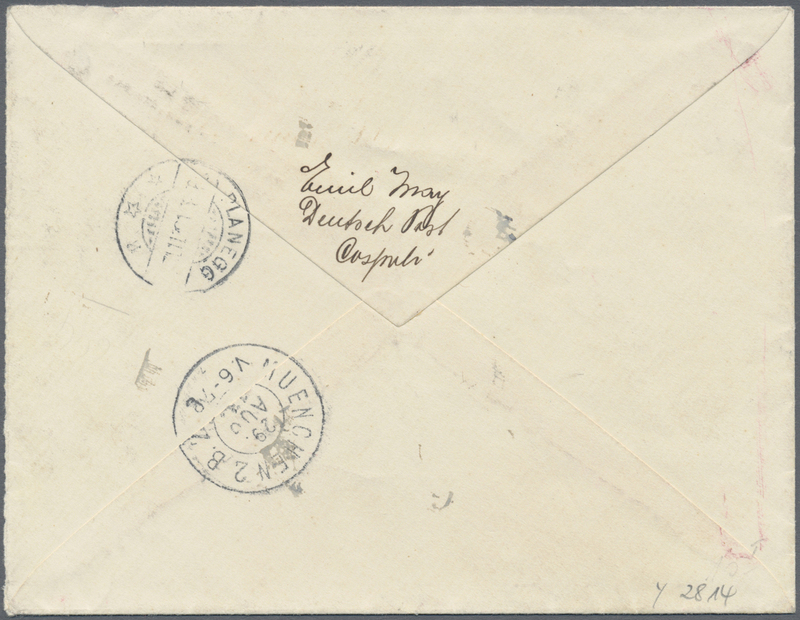 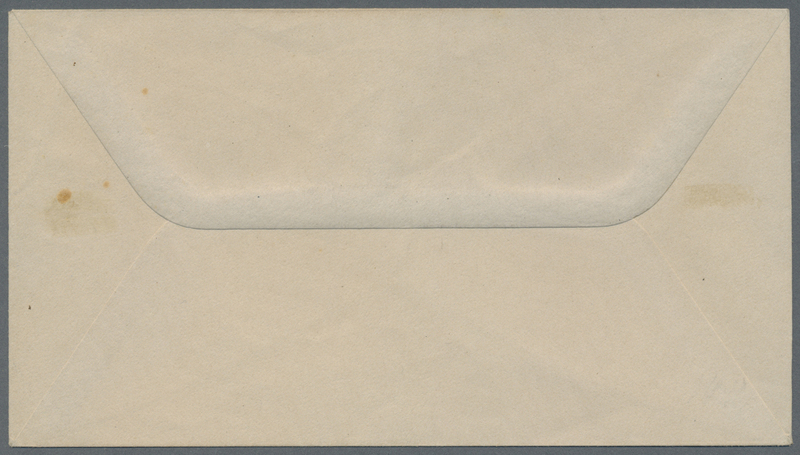 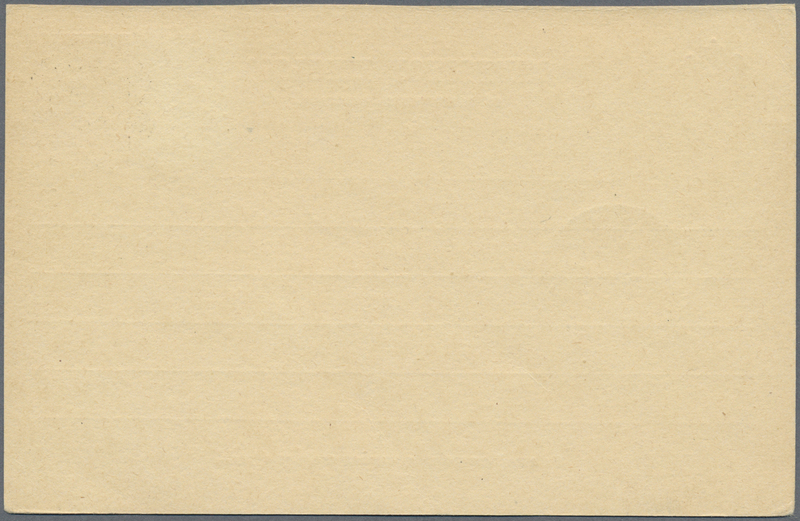 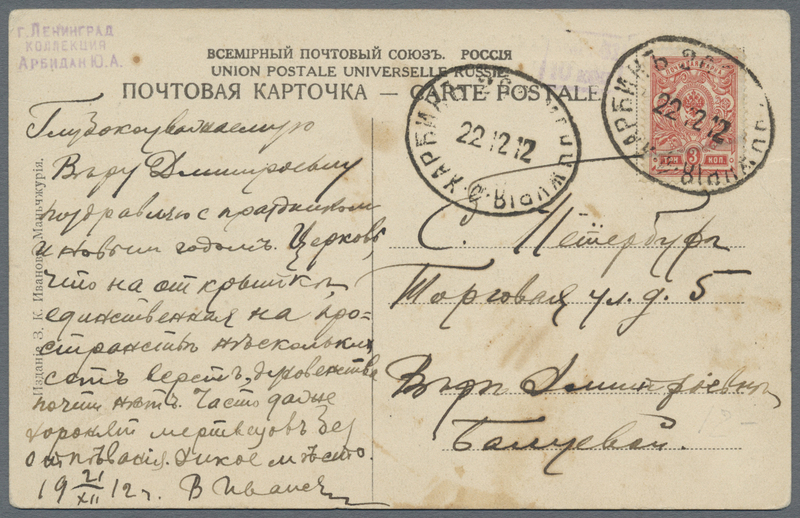 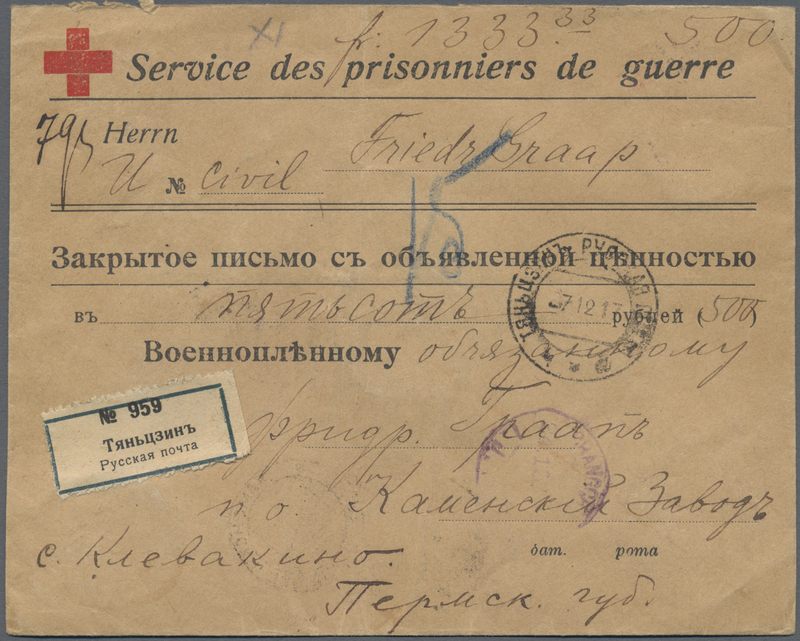 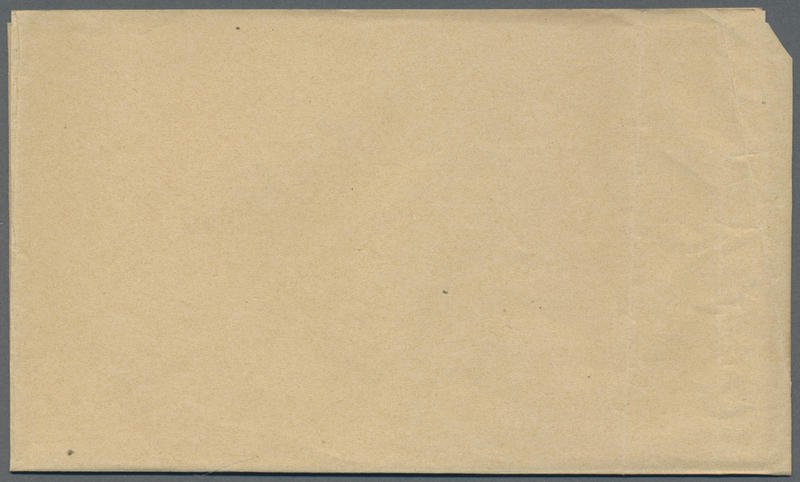 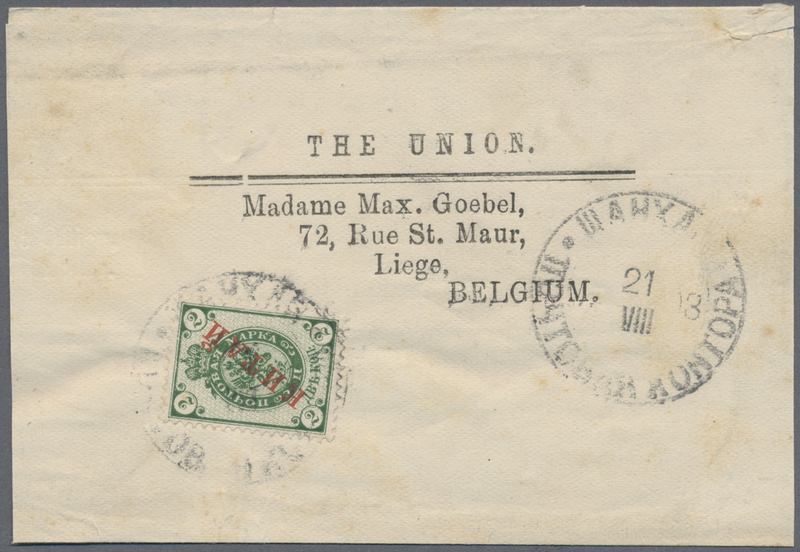 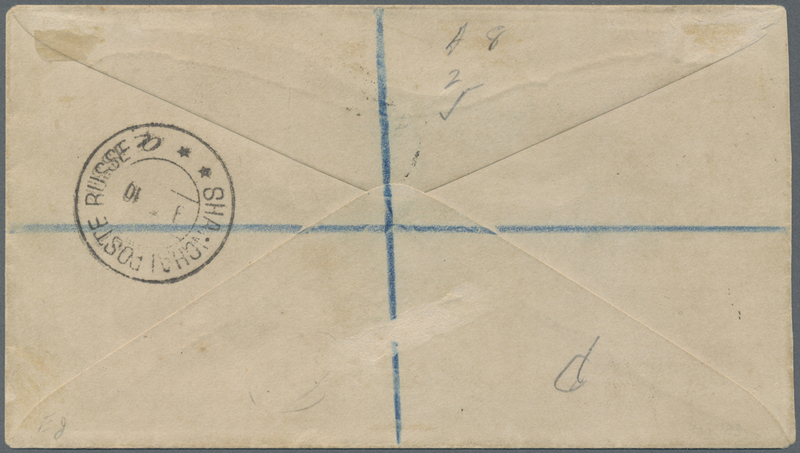 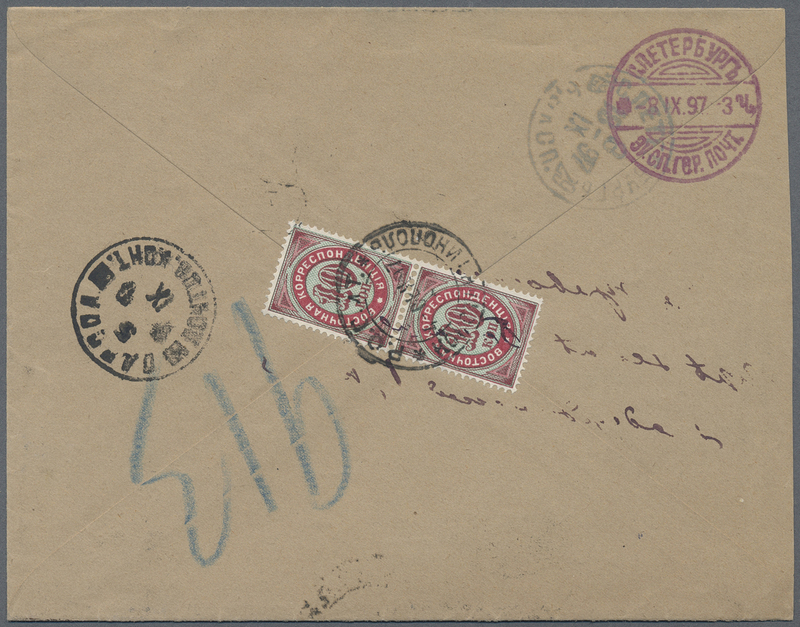 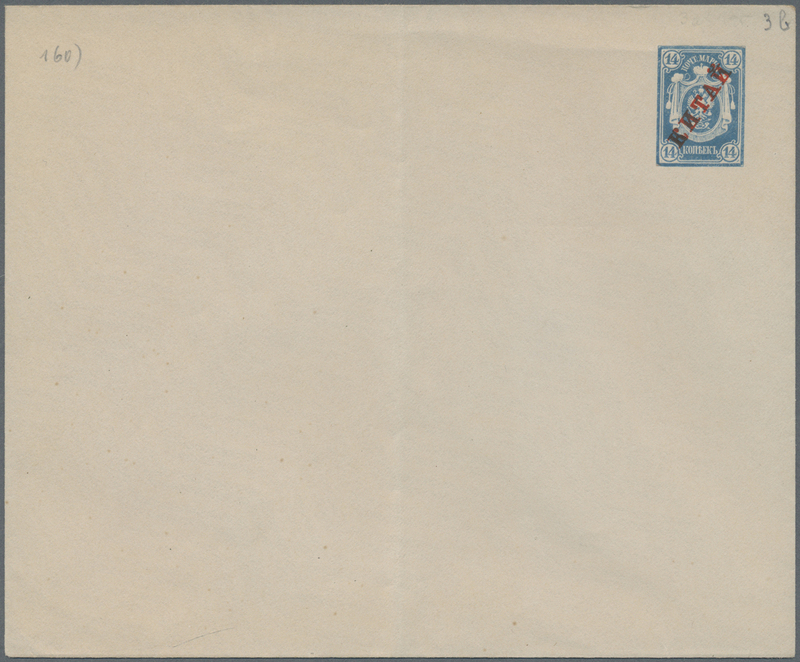 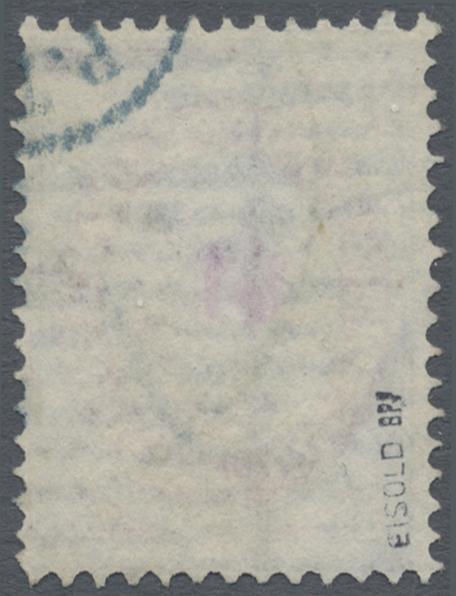 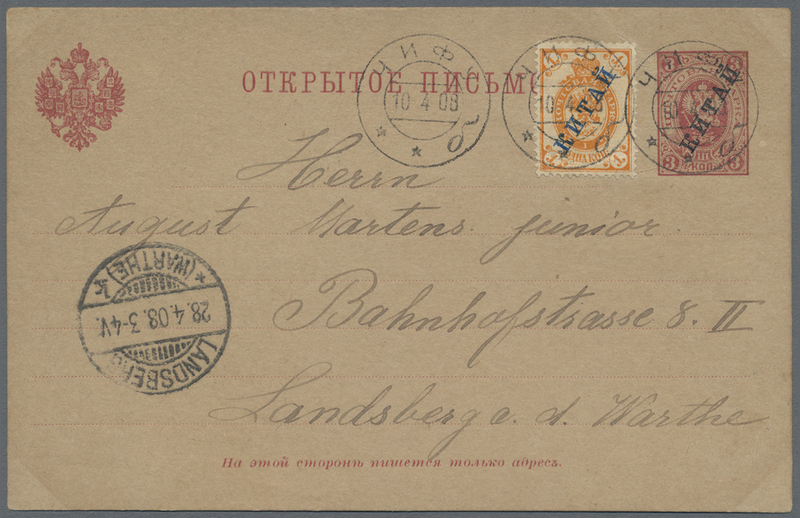 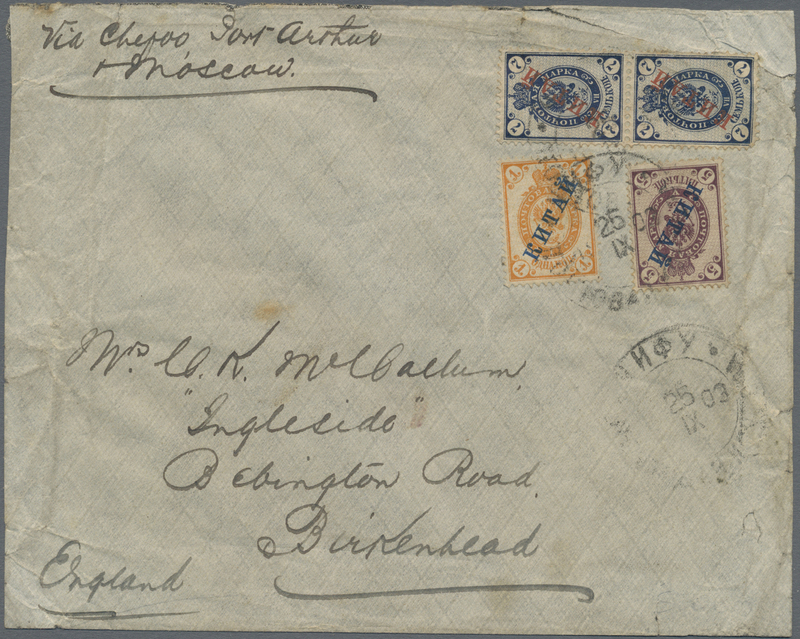 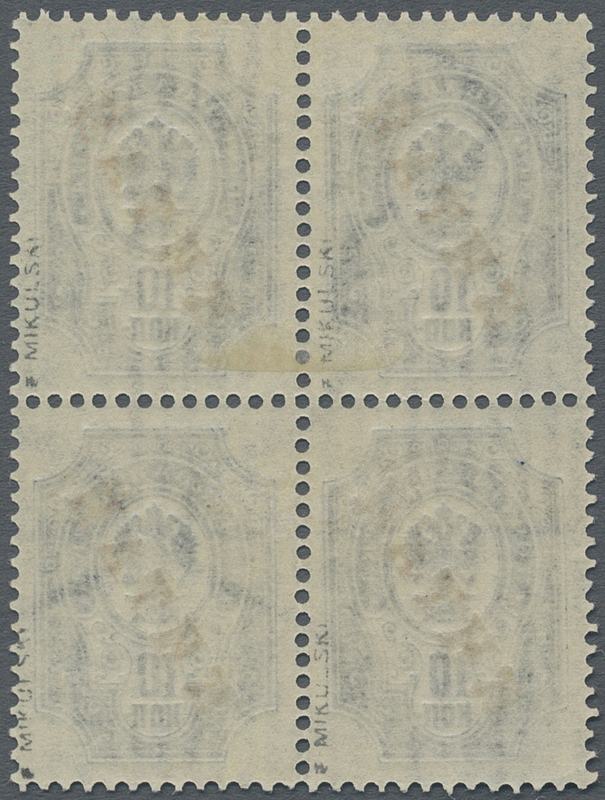 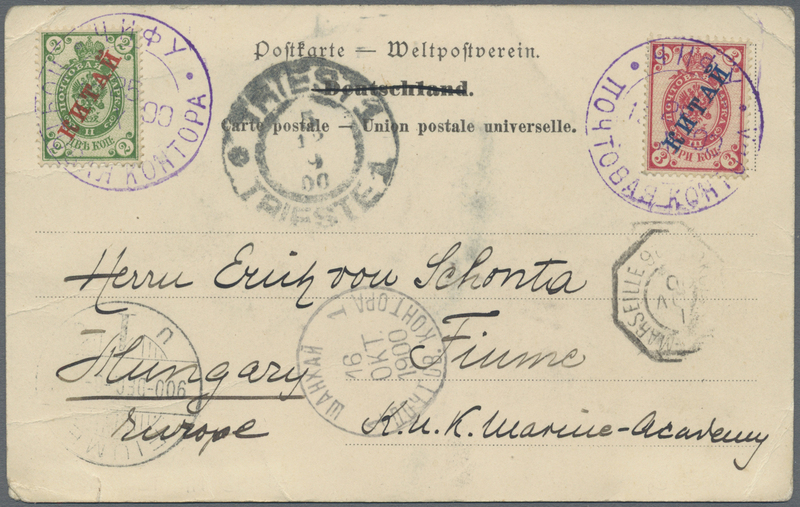 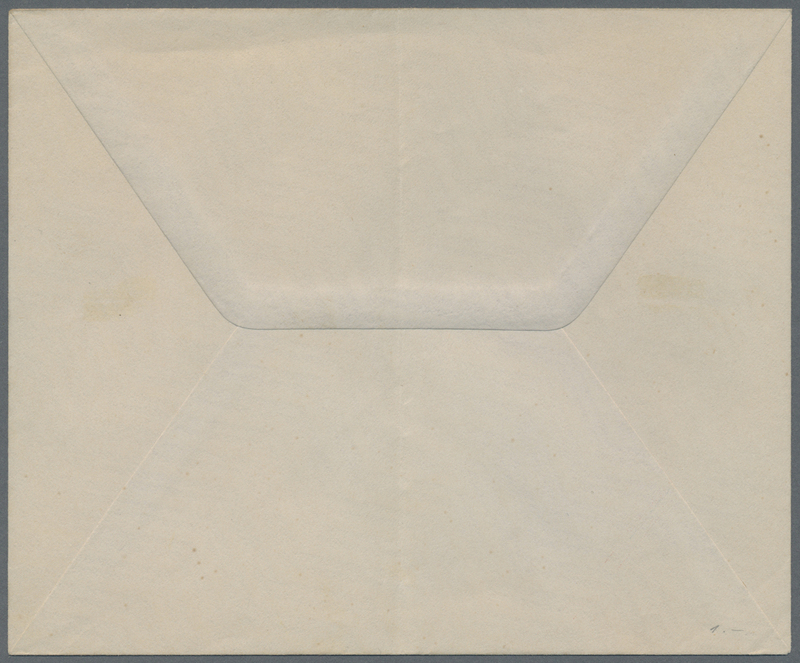 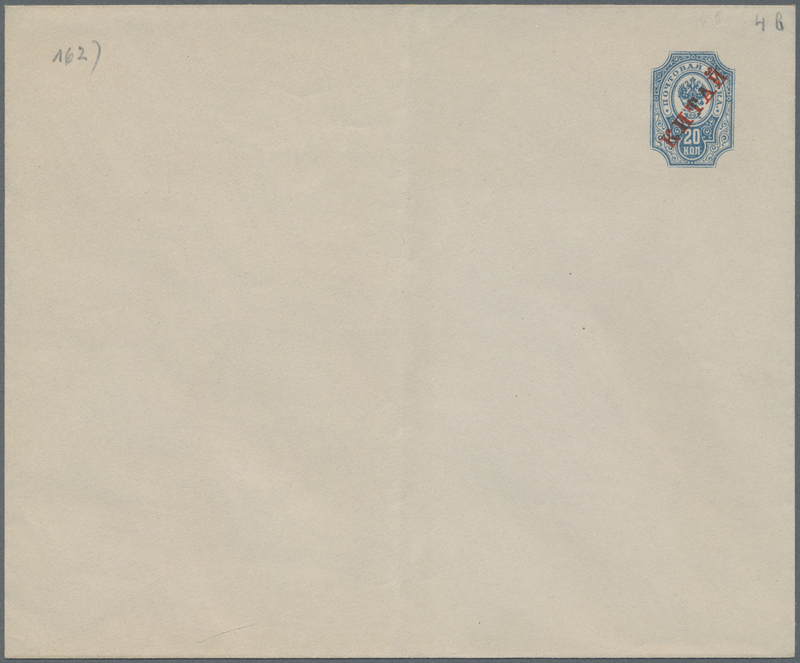 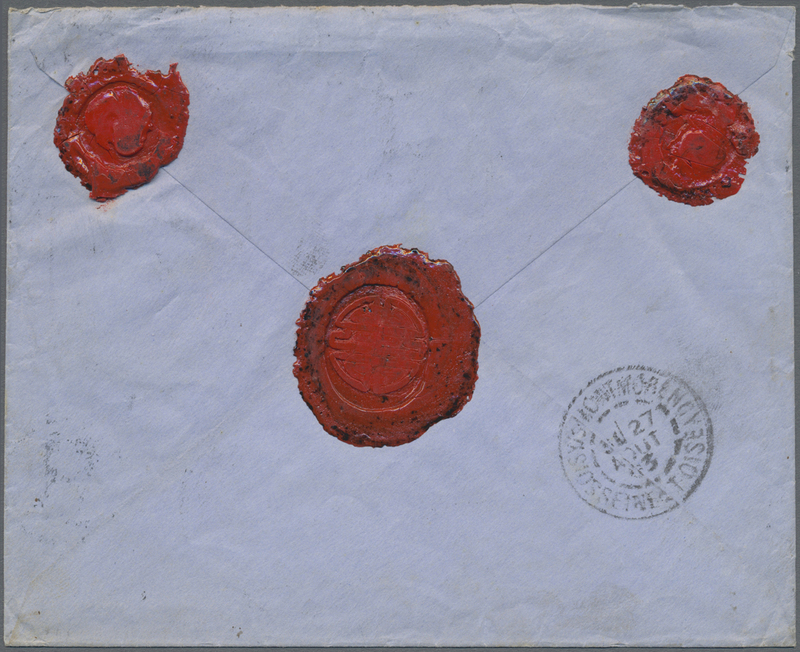 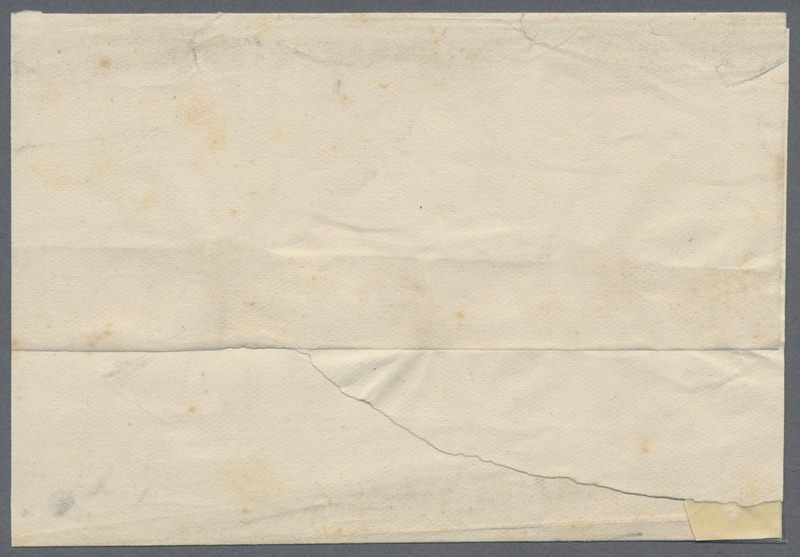 to France with scarce boxed registration marking, Aug. 27 backstamp. 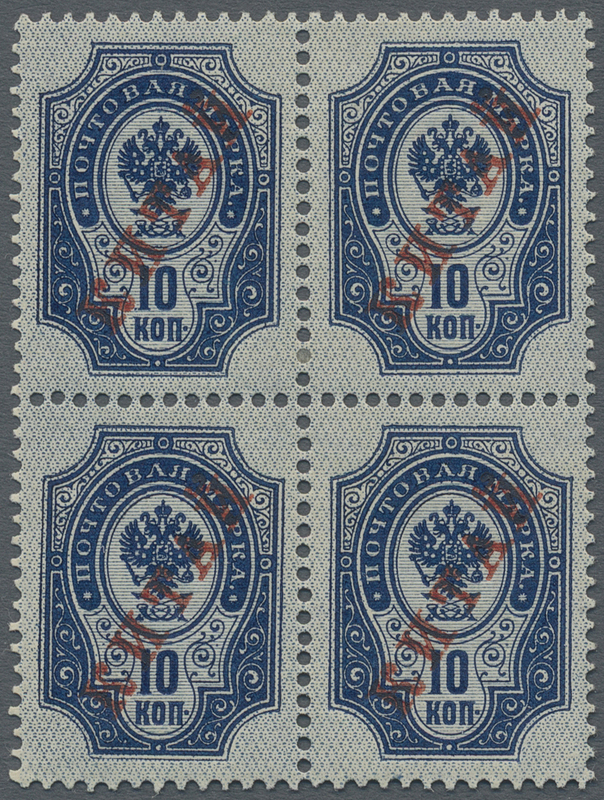 19894 ungebraucht (hinged) * 4er (Block) 7 y (4) 1904, 10 k. blue in bloc of four with overprint on vertical laid paper, unused, very fine, signed and certificate Mikulski, very rare! 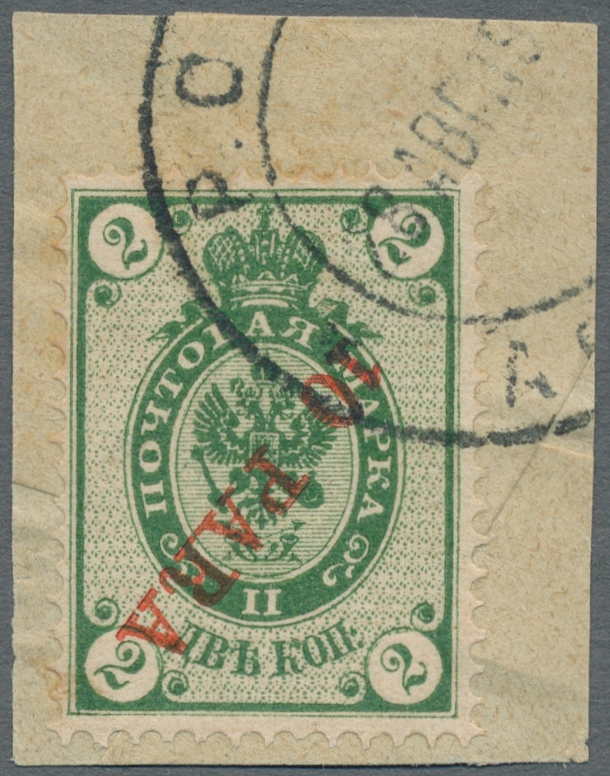 It is the best block of four of the 4 found up to date! 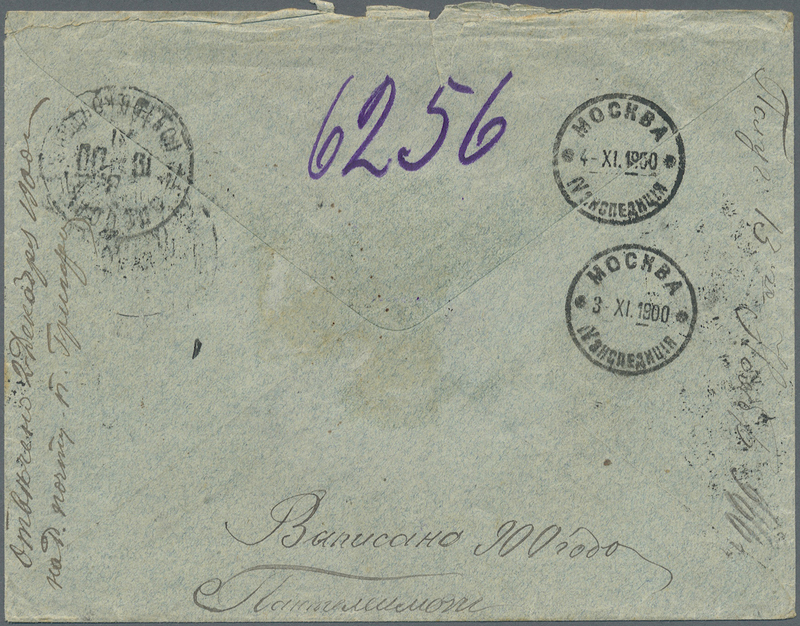 19897 Brief (cover) 37/42-ex 1917, 3 C./3 K., 10 C./10 K., 15 C./15 K. (3 inc. pair) tied "TIENTSIN ROSSICA POSTA 17.12.17" to reverse of registered cover to siberian POW camp, transit "TIENTSIN IJPO 21.12.17", "CHANGCHUN I.J.P.O. 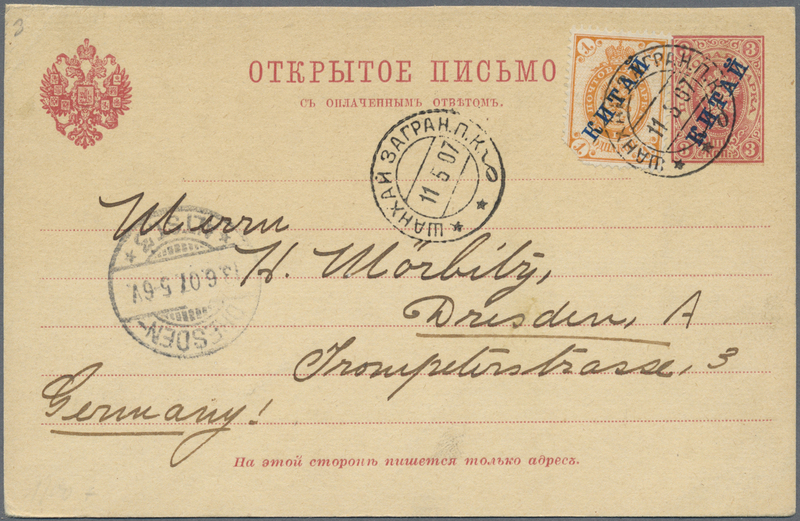 24.12.17" to Kamenskiy-Zawod w. Jan. 3 18 arrival. 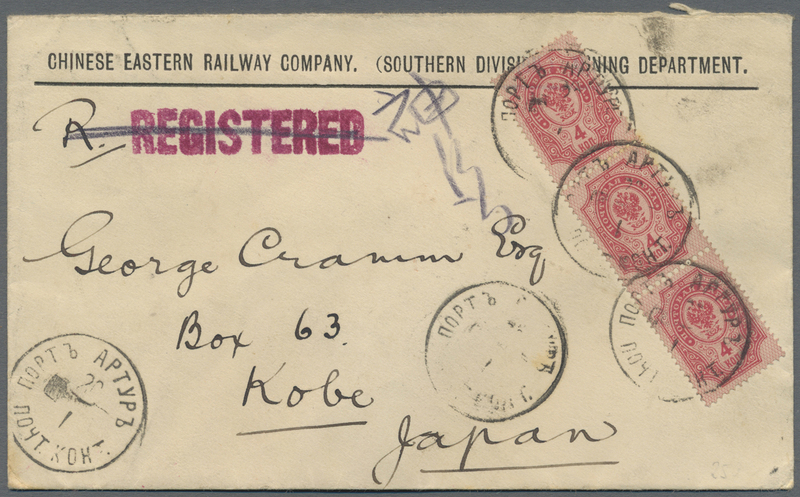 19898 Brief (cover) RU 40 1900, unoverprinted 4 K. (strip-3) tied "PORT ARTHUR 20 1 1900" via "NAGASAKI 12 FEB 00" to Kobe w. FEb. 14 arrival, preprinted cover return of "Chinese Eastern Railway Company. 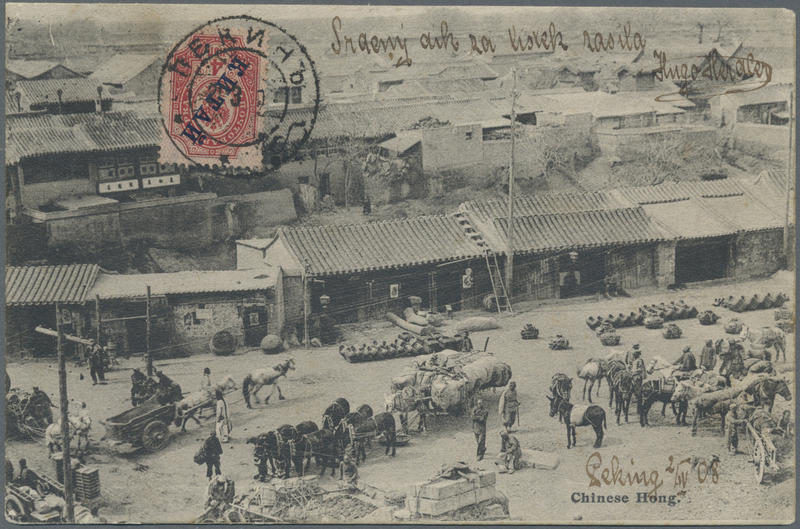 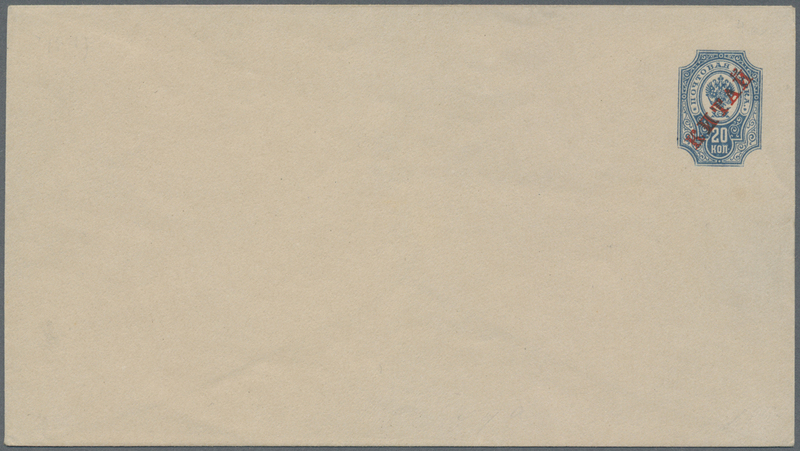 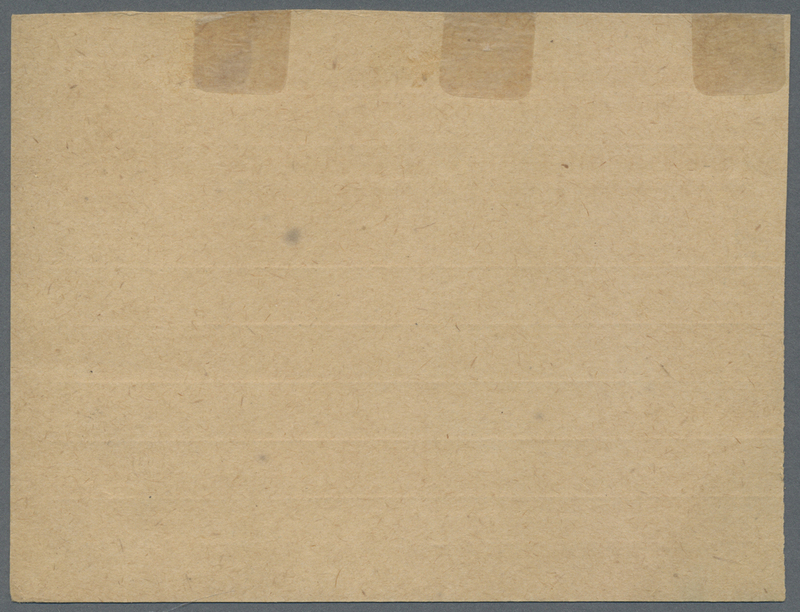 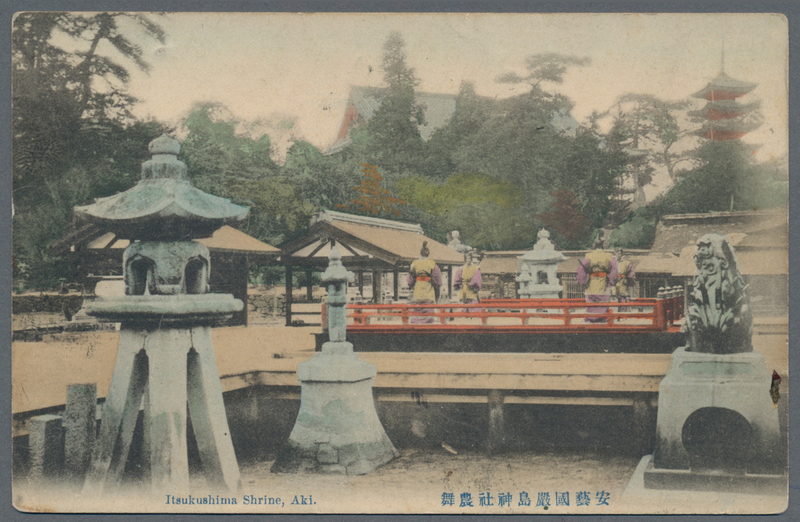 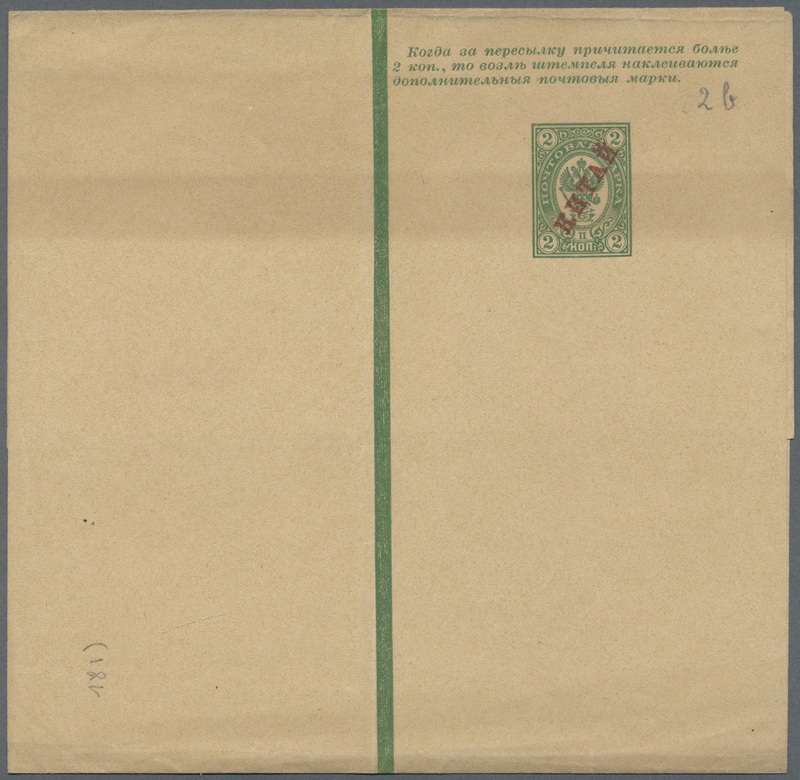 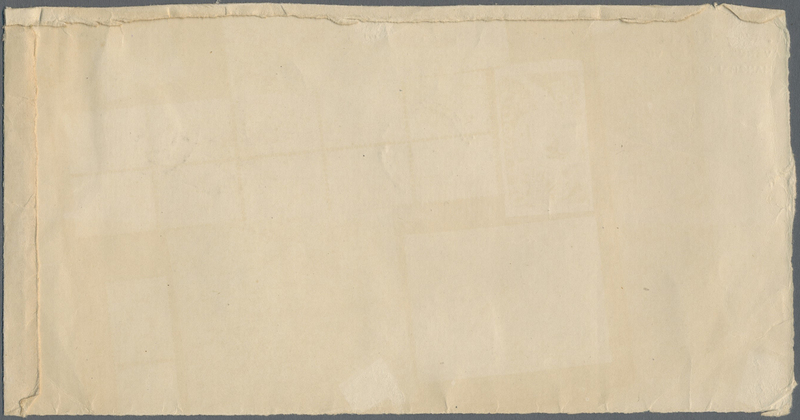 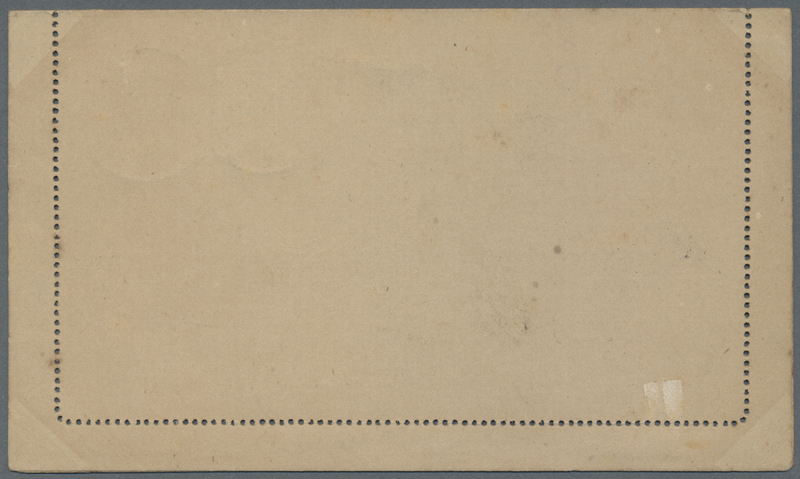 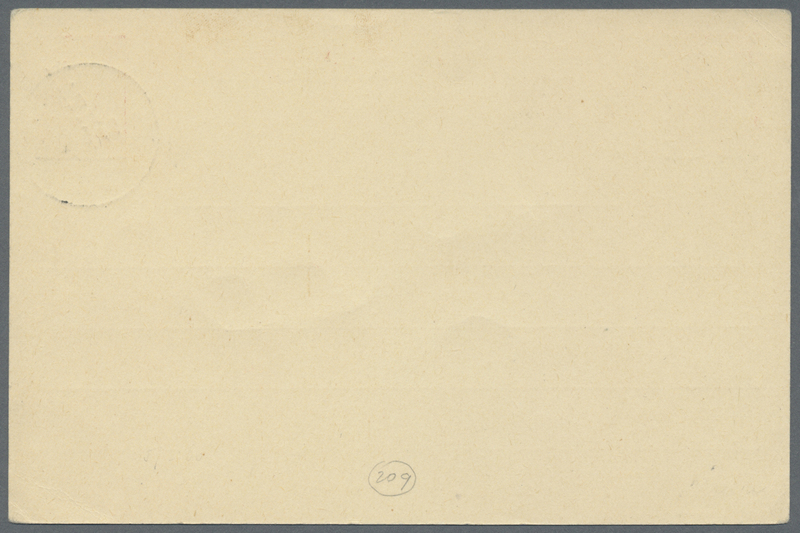 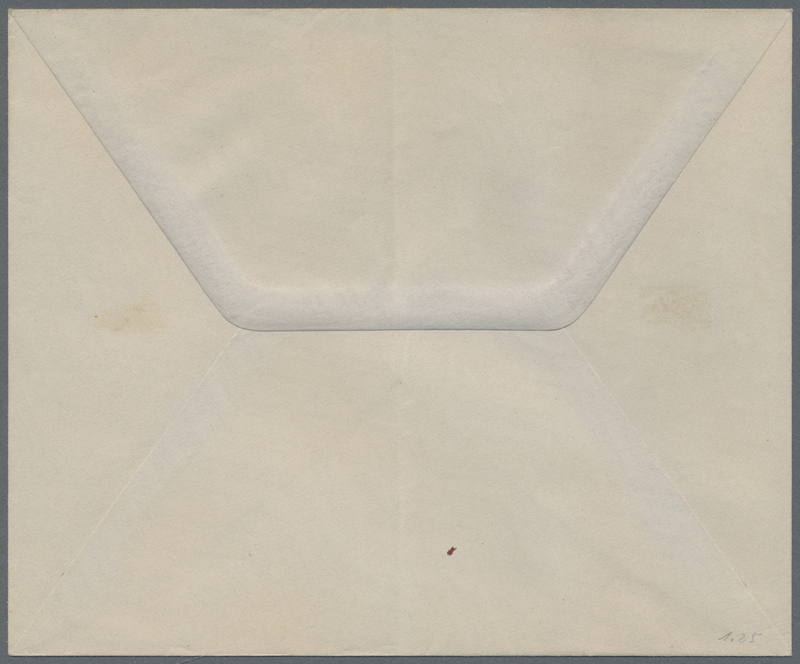 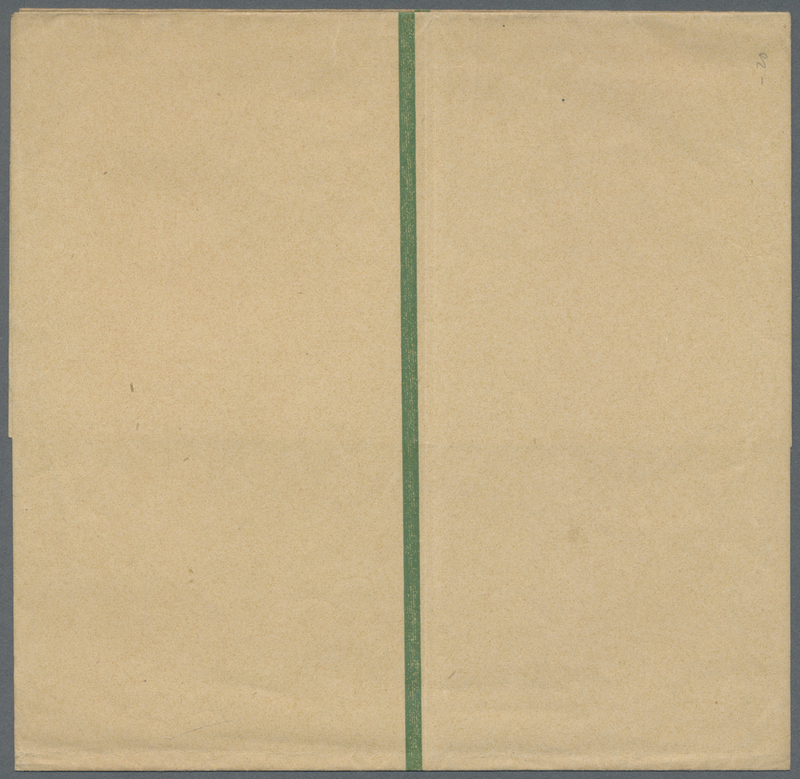 (Southern Divising Minining Department.)" 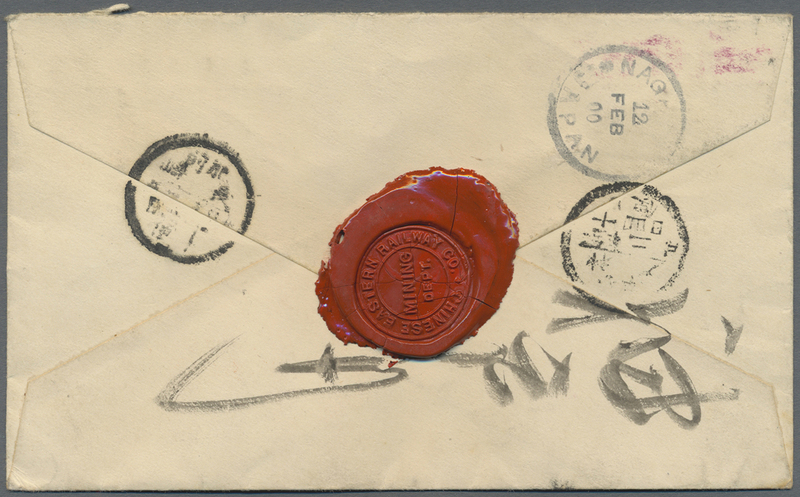 plus lacquer seal on reverse "CHINESE EASTERN RAILWAY CO. / MINING DEPT. 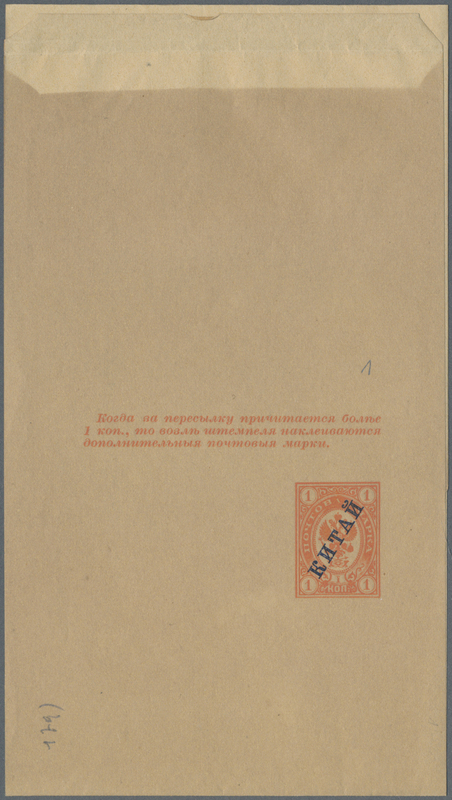 ", attractive. 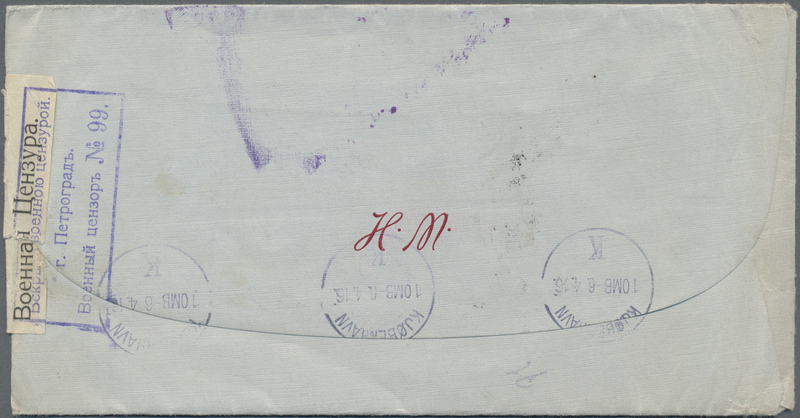 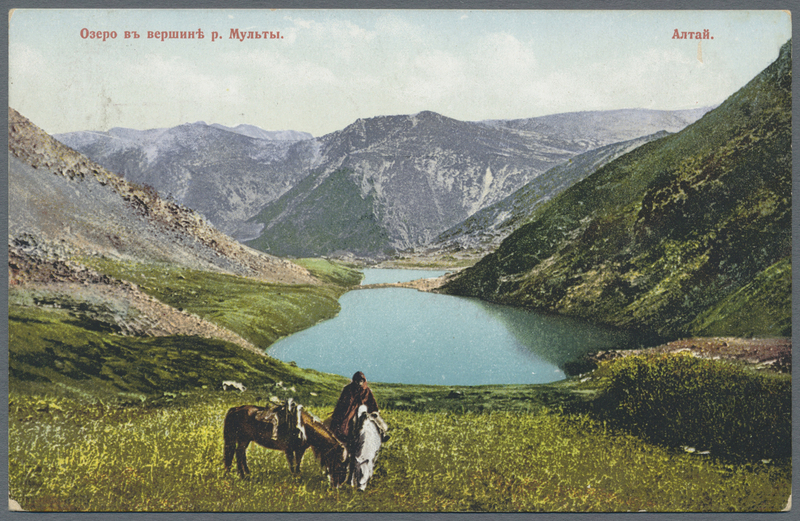 19899 Ansichtskarte (Picture postcard) RU 40 1904, unoverprinted 4 K. tied "PORT ARTHUR 15 I 1904" to ppc via Siberia and "MOSCVA 4 III 1904" to Algeria w. arrival. 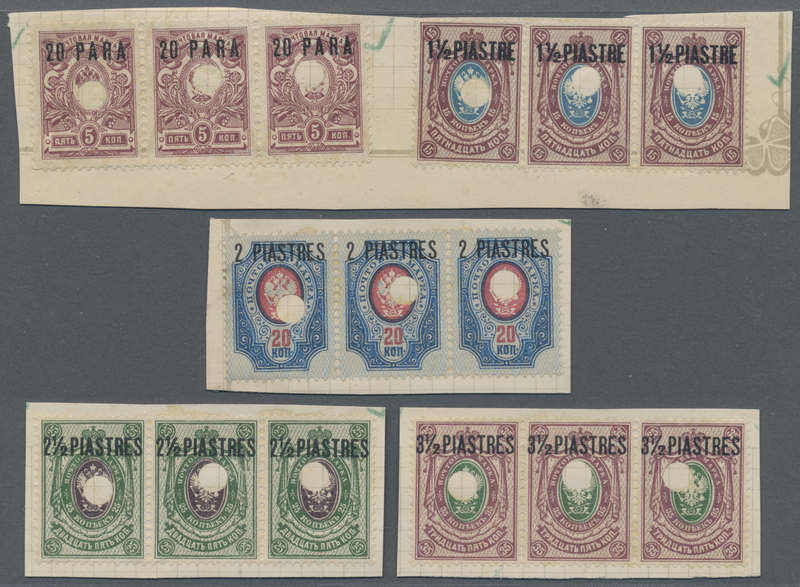 "BISKRA CONSTANTNE 24 MARS 03" and fwd. 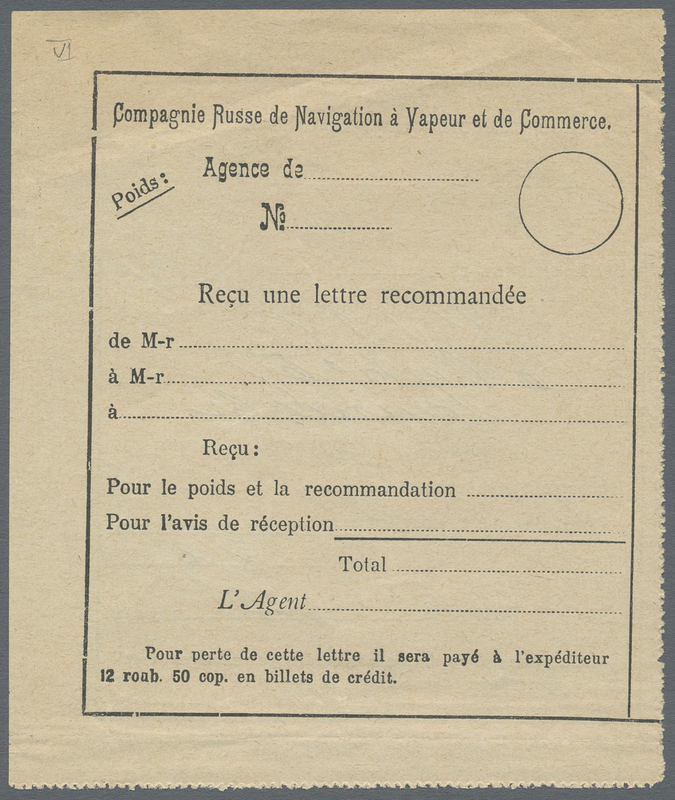 to Vichy/France. 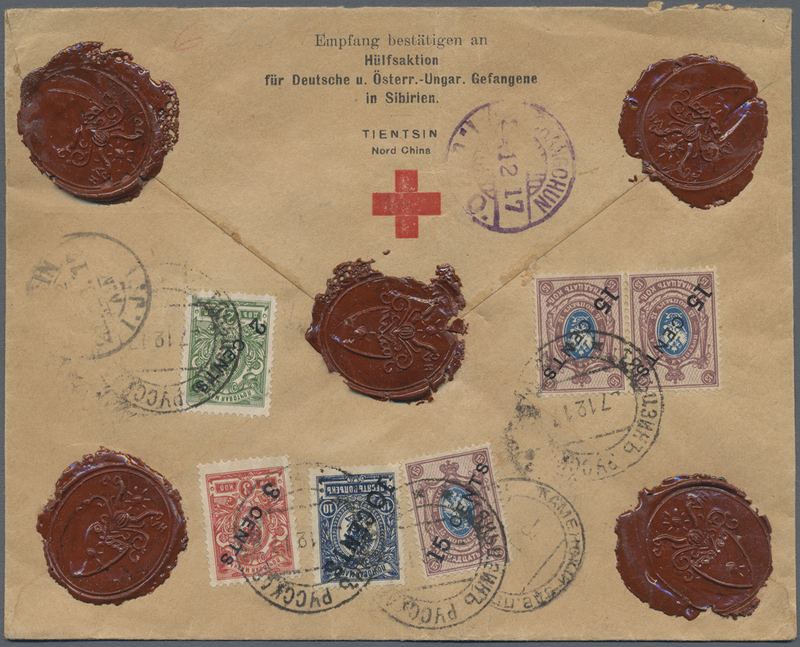 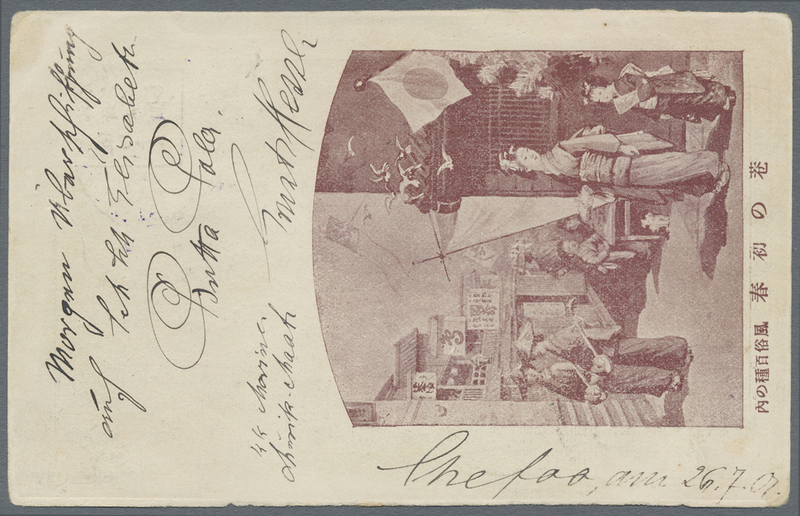 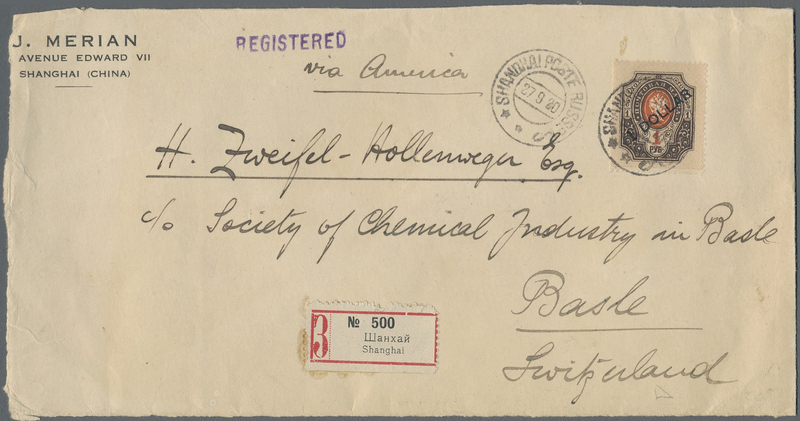 19901 Briefstück (on piece) Brief (cover) 48 1917, $1/1 R. tied "SHANGHAI POSTE RUSSE 27 9 20" to registered front cover to chemical industry board at Basel/Switzerland, scarce commercial usage. 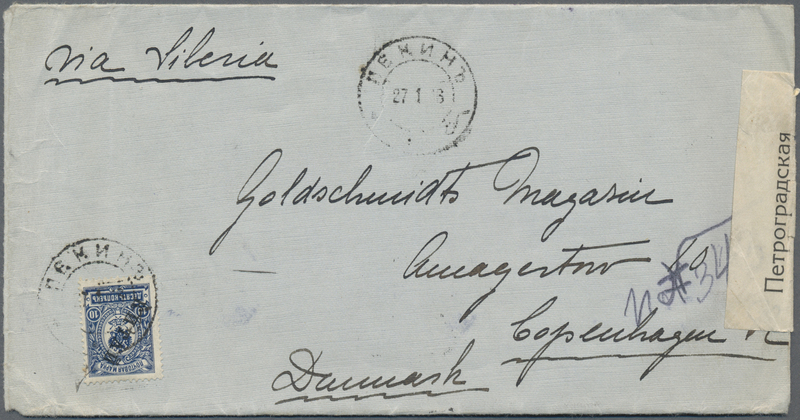 19903 Ansichtskarte (Picture postcard) 1904/15, TPO railway on ppc (4): single circle "postal vagon 261 19-I-04" as transit Moscow-Peking, also transit russian p.o. 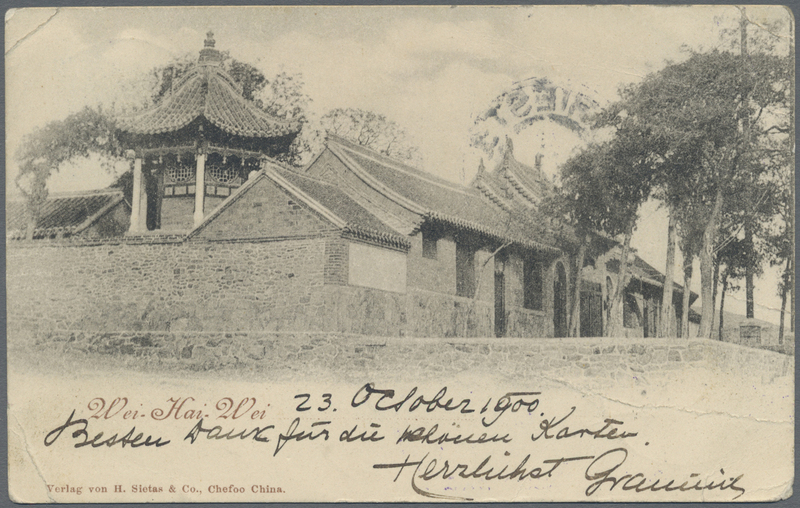 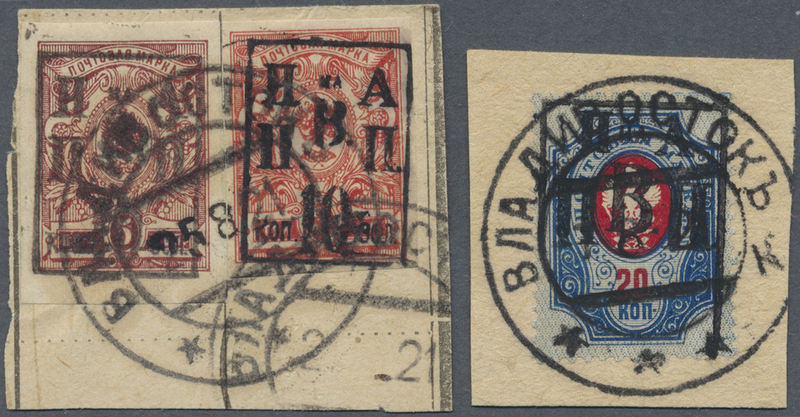 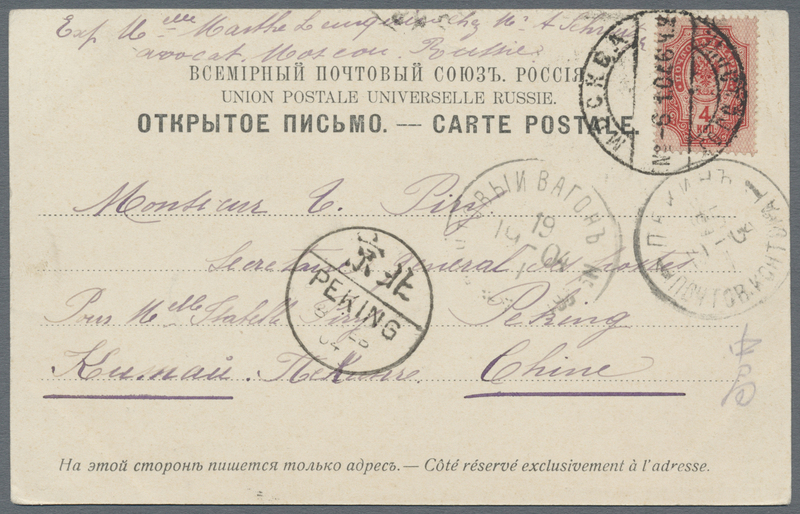 Peking; oval "260 Manchuria-Chita 8 6 15"; oval "262 Harbin-Manchuria 22 12 12"; oval "Harbin Station 20.3.12", the latter three all used to Russia inland. 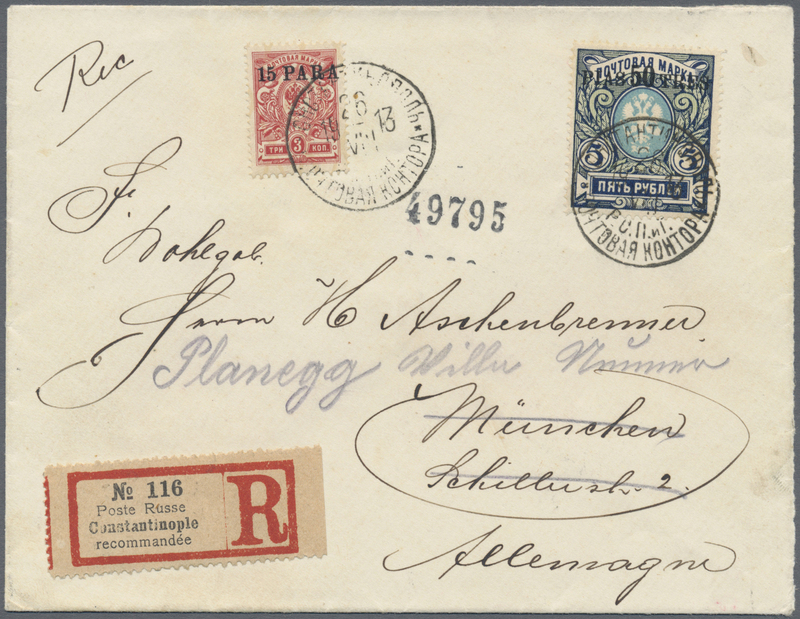 19913 Brief (cover) Ansichtskarte (Picture postcard) Ganzsache (Complete) 20 (4), 61 (2) 1902/1913, lot of 3 entires: commercially used card Jerusalem 1902, commercially used stationery card 20 pa. on 4 kop. 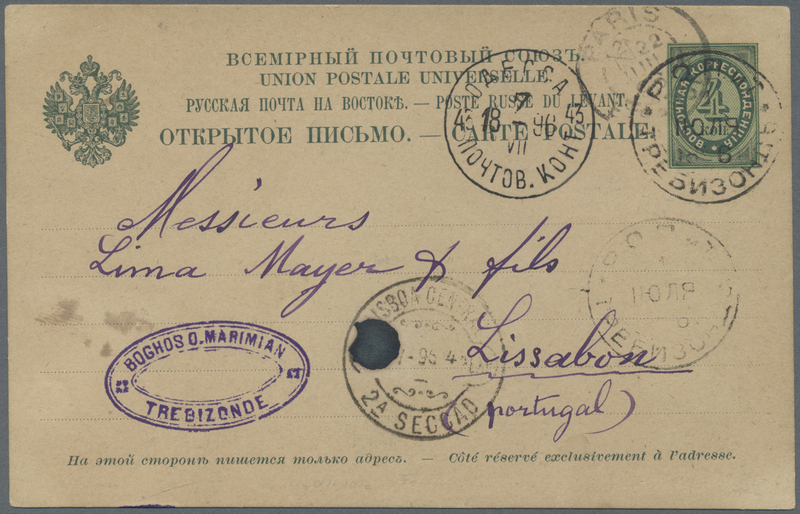 to Belgium and ppc "Eski-Chehir" to Lisbon. 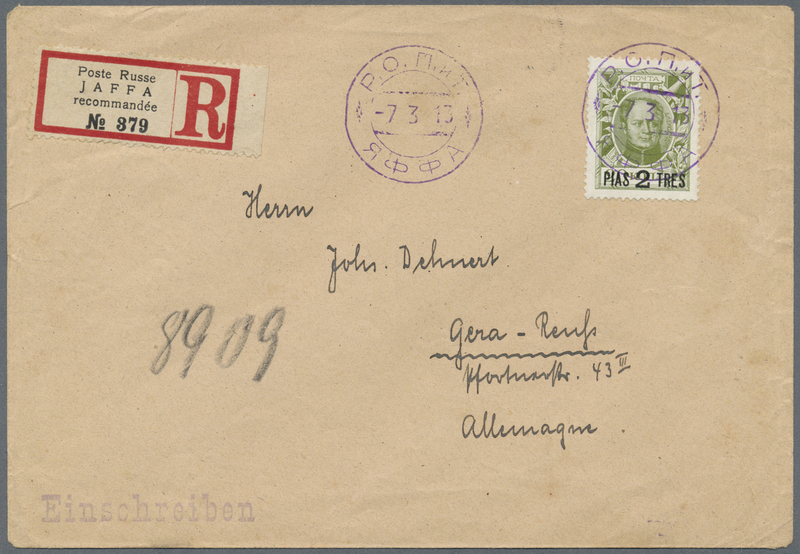 19920 Brief (cover) 1913, 2 Pia./20 K. tied violet "ROPIT JAFFA -7 3 13" to registered cover to Germany, on reverse transit POrt Said and arrival "GERA 31.3.13".